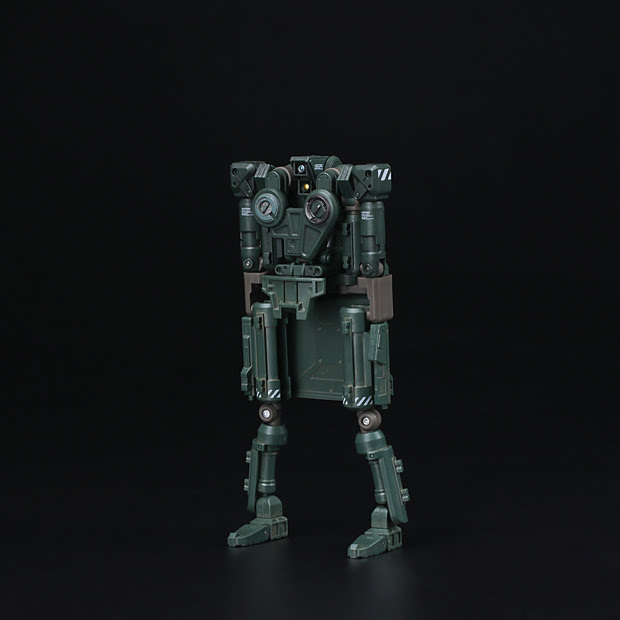 Happy New Year from 1000toys! A big thank you to all our fans for your support this past year, and we look forward to keeping everyone surprised and delighted in 2019. We thought we would take a moment and look back at 2018. 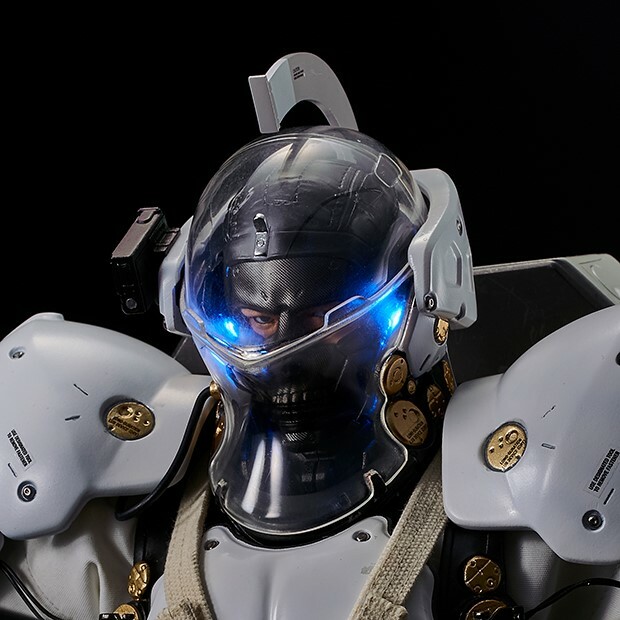 2018 was a spectacular year for 1000toys - from Iconic character productions to Original direct-with-creator projects plus the continuation of nu:synth initiative line of designer action figures, there were many new exciting releases that ran the gamut. 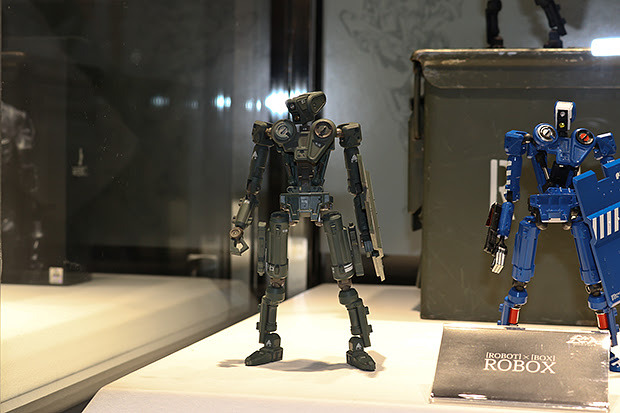 As we opened 2018, Iconic licensed productions announced in 2017 rolled off the production line including the Iron Giant from the landmark animated film and 1/12 scale Killy with Safeguard from the Netflix/Polygon Pictures production of the Nihei Tsutomu manga of the same name. 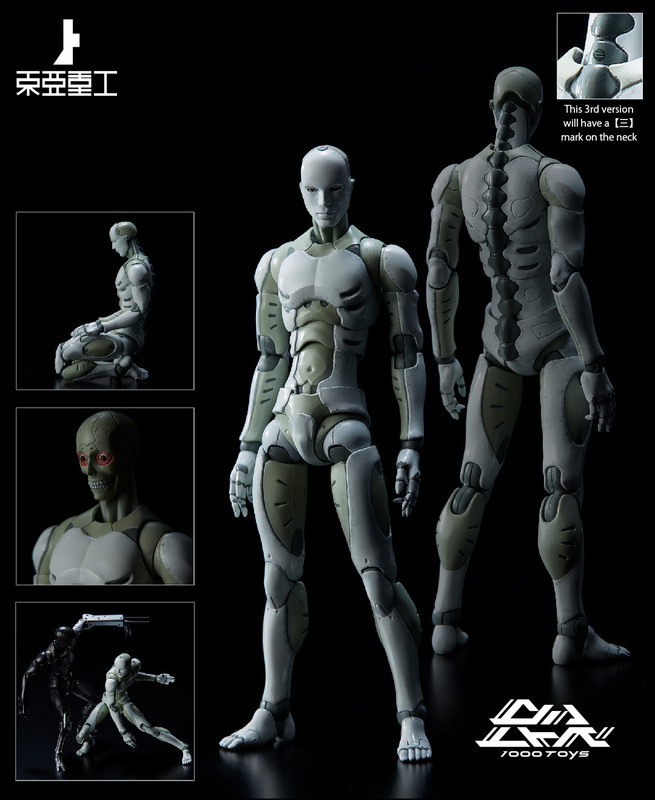 Continuing the connection with Nihei, we produced the first figure from his latest work - Aposimz (Ningyo no Kuni) - the 1/12 Etherow figure. 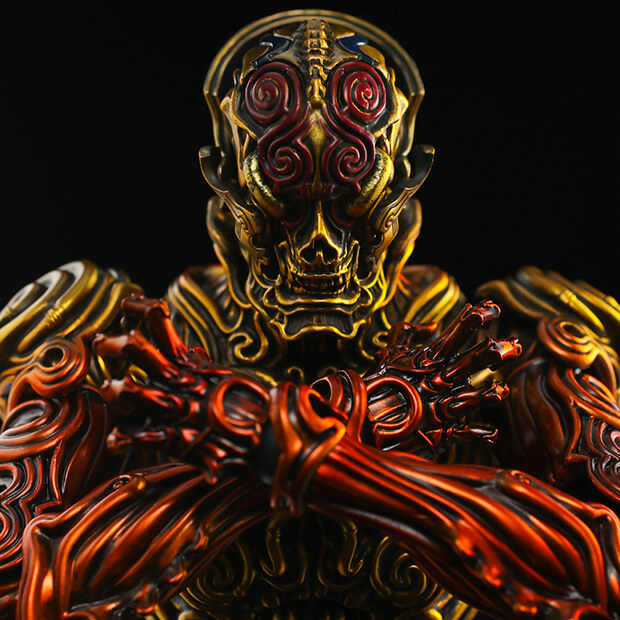 Summer saw our biggest announcement of the year with the reveal of our 1/12 scale HELLBOY action figure (Mignola approved!) 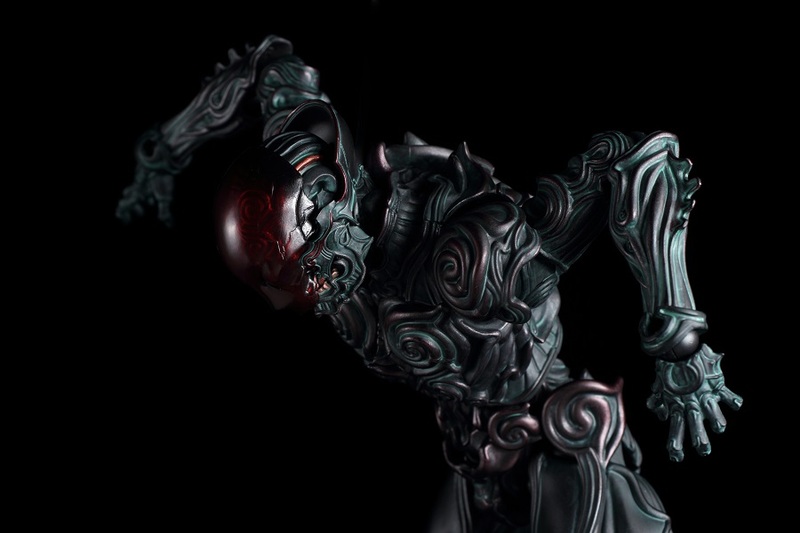 - the DX version of which was leveraged by Dark Horse to launch their direct to consumer Dark Horse Direct in-line collectible shop. 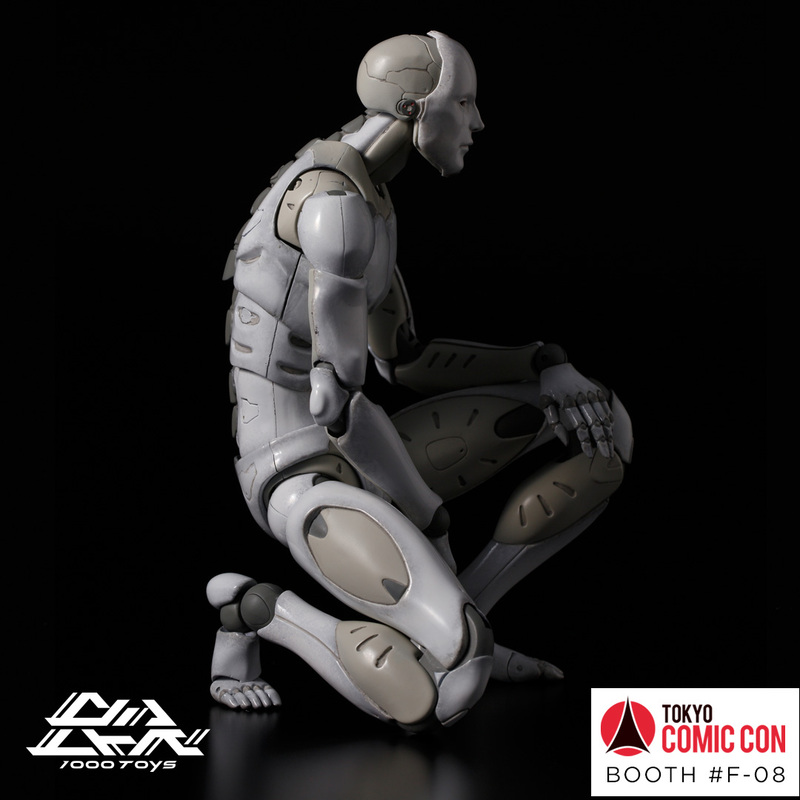 From the 1000toys TOA Heavy Industries line, San Diego Comic Con 2018 saw the debut of the 1/12 scale Test Body Synthetic Human, a faithful reproduction of the much sought-after ? 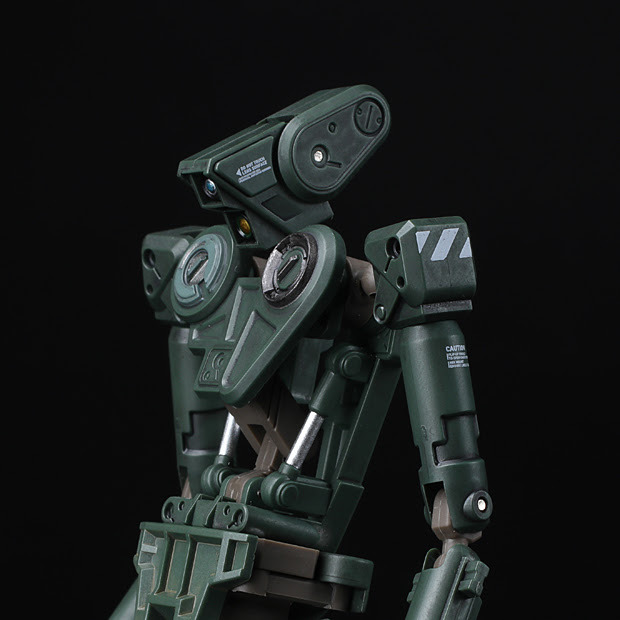 scale Test Body colorway of the Synthetic Human which had debuted 4 years earlier at the same event. The Test Body was an exclusive at events all over the world including San Diego, Shanghai, Singapore, New York, Taiwan, Pasadena and Hong Kong. 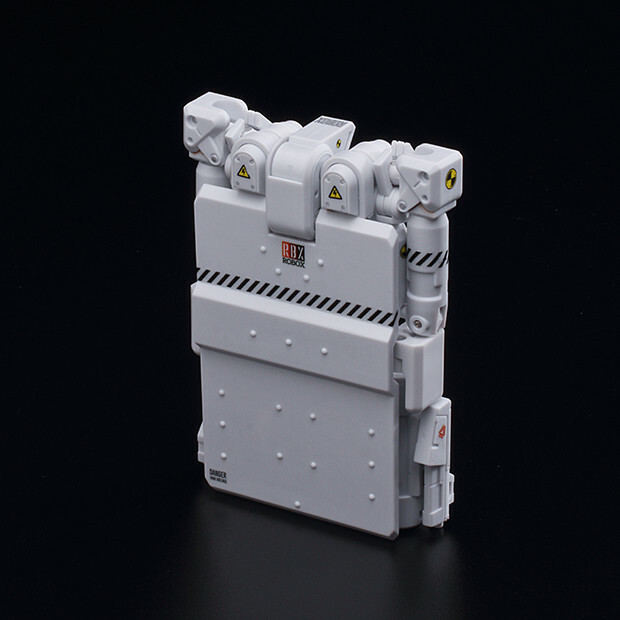 Another exciting direct-with-creator Original production from 2018 included the 1/12 scale　ROBOX. 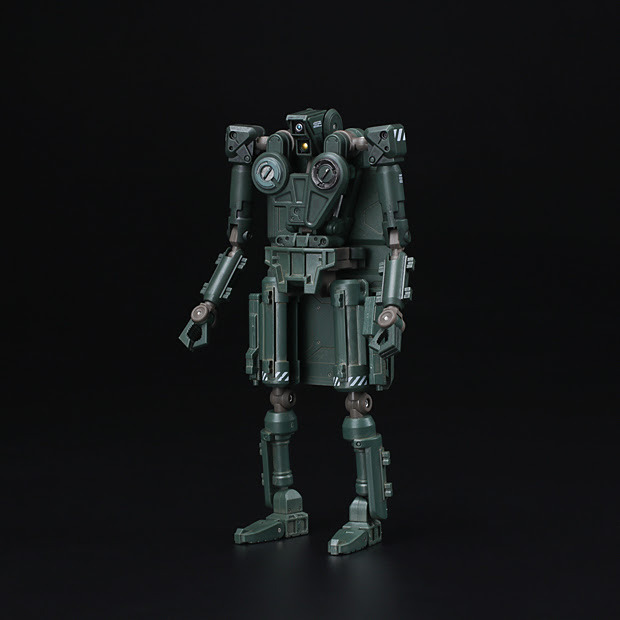 Developed in close collaboration with master illustrator Kim Jung-Gi, this transforming Robot figure was released in a fully finished retail version plus three exclusive DIY versions in Canvas White, Black and Military Green. We were additionally honored to host Kim Jung Gi for a couple of drawing sessions at our Tokyo Comic Con booth this past December. 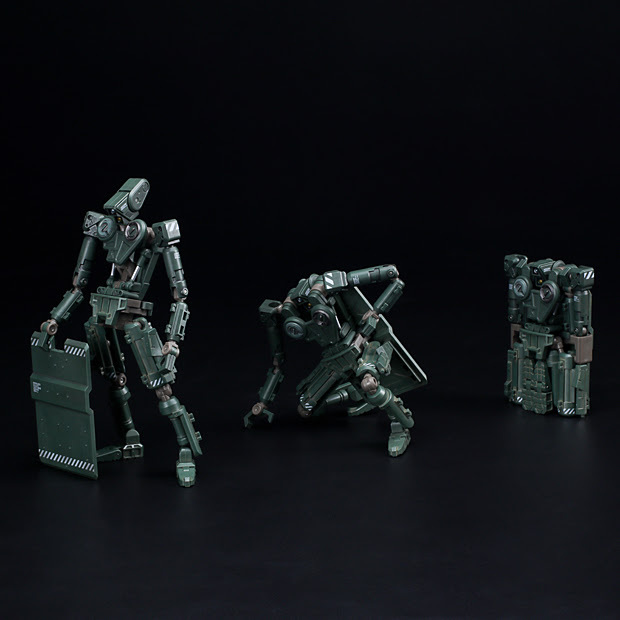 The first half of 2018 saw the release of the remaining figures from nu:synth initiative Wave 1 including Teal Knight & Lime Knight from the Knights of the Synth (Toy Pizza) series and Future & Cyclone from the Nextman Synth (RealxHead) series. 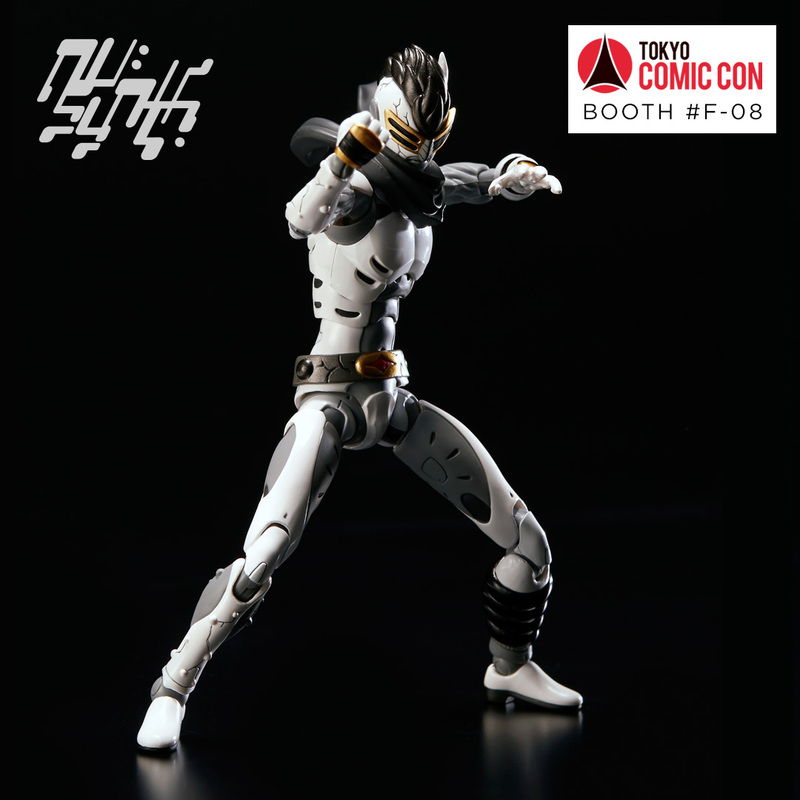 DesignerCon 2018 saw the first release of figures from Wave 2, including Pheyden & Buildman from the Glyosynth series with American indie figure pioneer Onell Design and Aitsu from the Un:Synth Heroes series with Japanese premier street brand Punk Drunkers. Another highlight of 2018 was SYN HMN RMX (Synthetic Human Custom Show) - our touring art show that featured amazing original creations by an international roster of superstar Creators and Customizers. 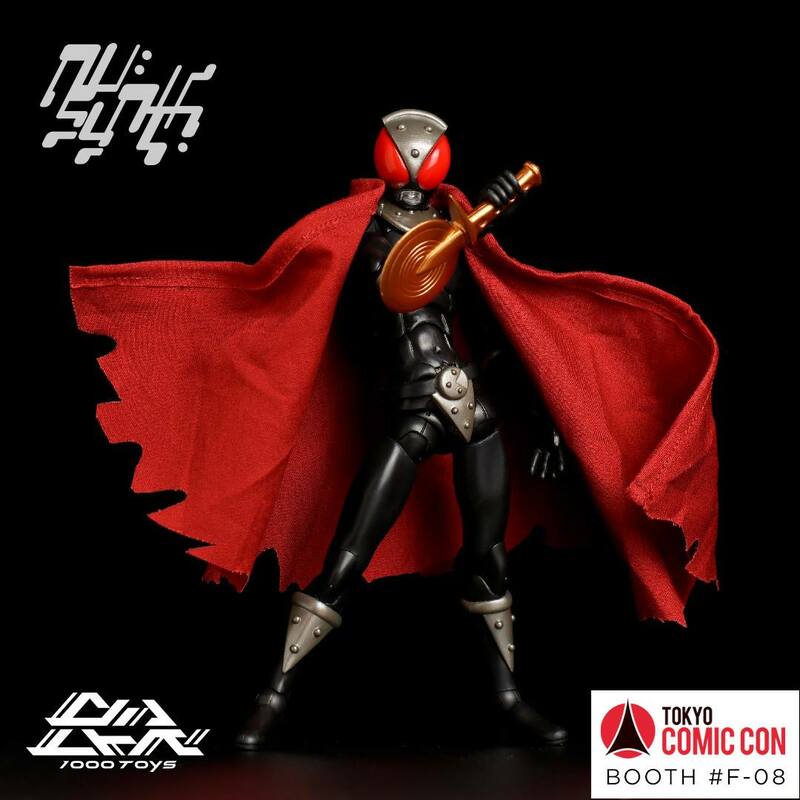 Gallery SF Dept (Tokyo - February), ToyCon UK (London - April), Thailand Toy Expo (Bangkok - May), Five Points Festival (Brooklyn - June), Wrong Gallery (Taipei - October) and DesignCon 2019 (Pasadena - November). One thousand thanks to all the artists who participated and a special shout out to the Antireal crew for graphic support. 2019 is going to be even more exciting! 1000toys will continue to add Iconic licensed productions to its portfolio including beloved game characters. Hellboy is scheduled to drop in April 2019 with figures of Abe Sapien and Lobster Johnson soon to follow. 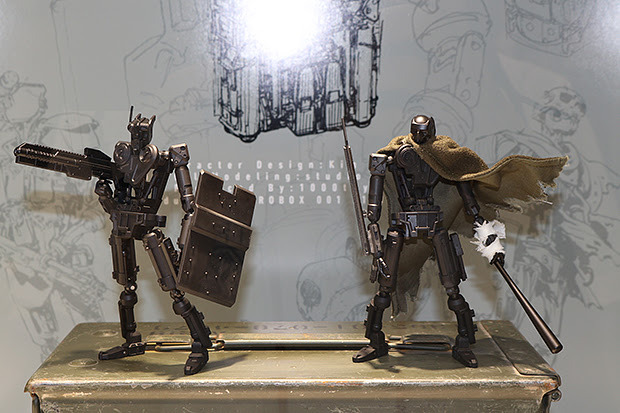 2019 will also see the release of the remaining figures from the Wave 2 series plus sneak peaks of what is coming in Wave 3! 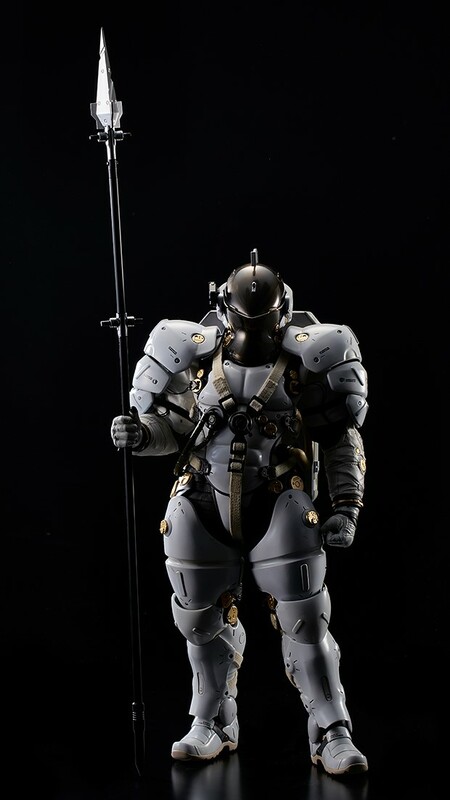 Also keep an eye out for several new items with Nihei Tsutomu plus new collaborations with IZMOJUKI. 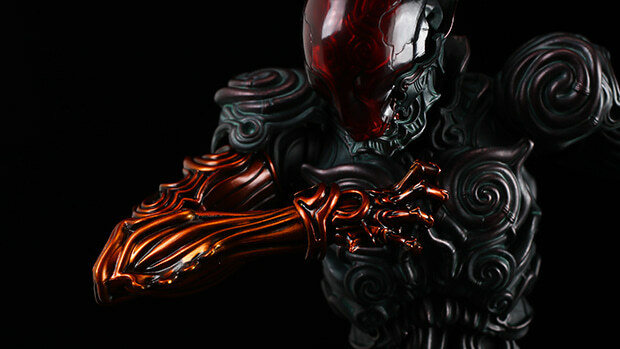 Also a special co-production with Malaysian artist 1000tentacles studio is in the works. And much much more! As always stayed tuned to our social media channels for the latest news! We would like to inform our customers that 1000toys will be entering a winter break and customer support will be unavailable during the following period. Our business will resume on January 7th (Mon). 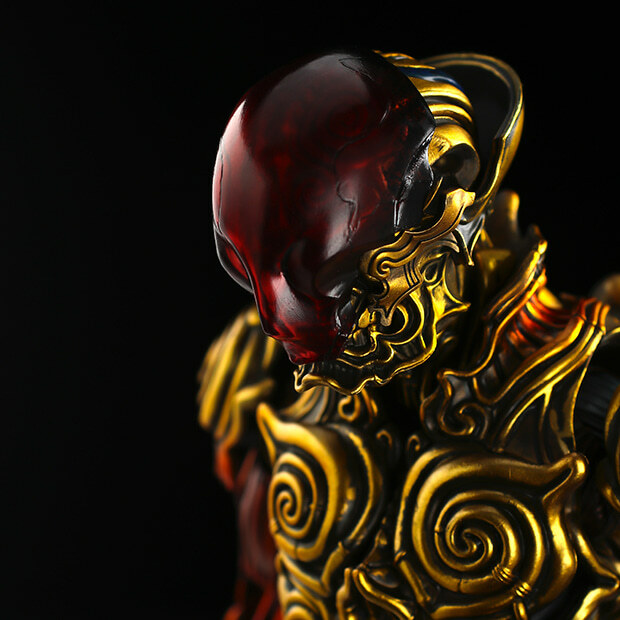 Any inquiries received by the 1000toys customer support during the period above will be corresponded in order of receipt from January 7th (Mon). Due to the volume of inquiries, please allow for 2 to 3 days from January 7th (Mon) for correspondence to inquiries sent during this period. We apologize for any inconvenience this may cause, and kindly ask for your understanding and support. 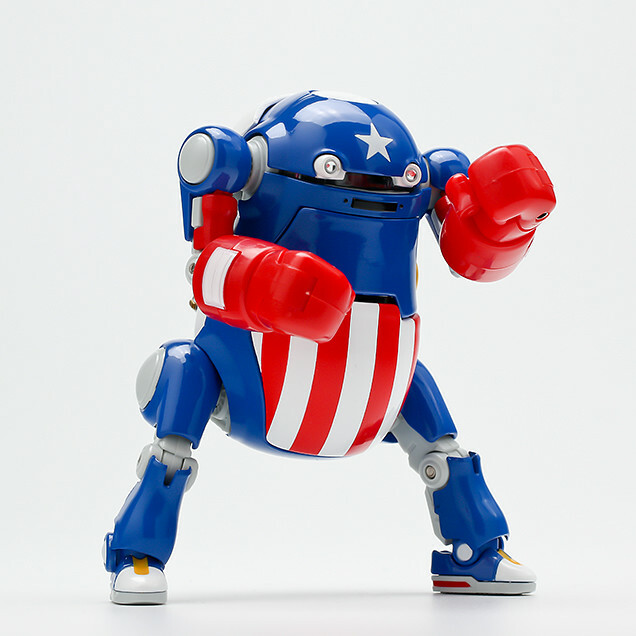 Here Comes the RIOBOT Iron Giant! The wait is almost over! 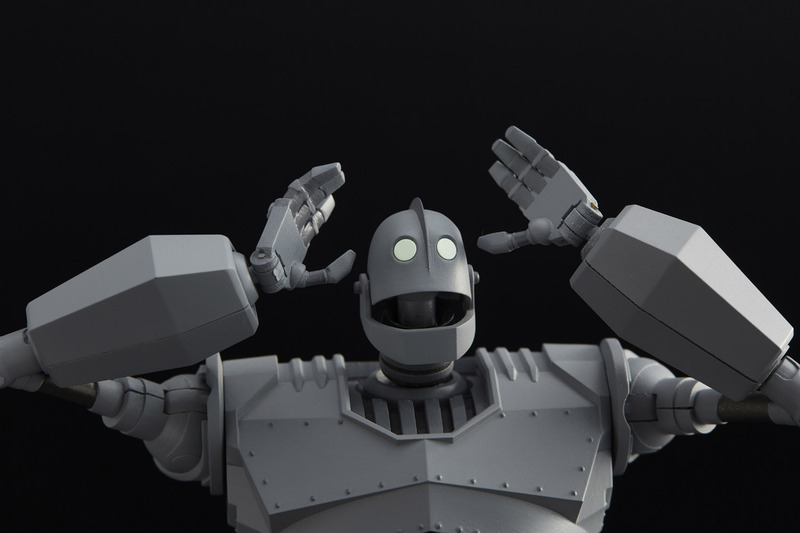 The much anticipated RIOBOT Iron Giant from 1000toys has finished production and will be available at stores in Japan on September 15 with availability in the rest of the world soon to follow! 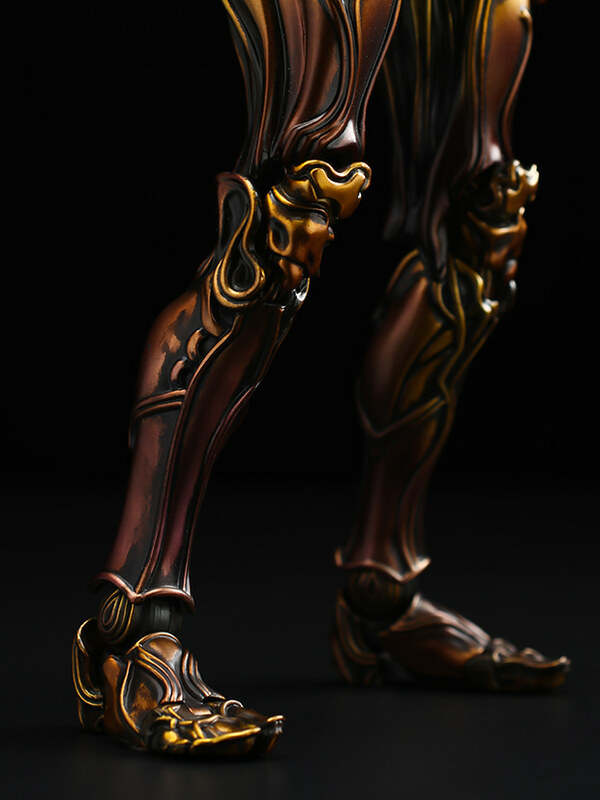 ※Note release date is for Japan only and will differ overseas. Let’s take a look at the finished product! 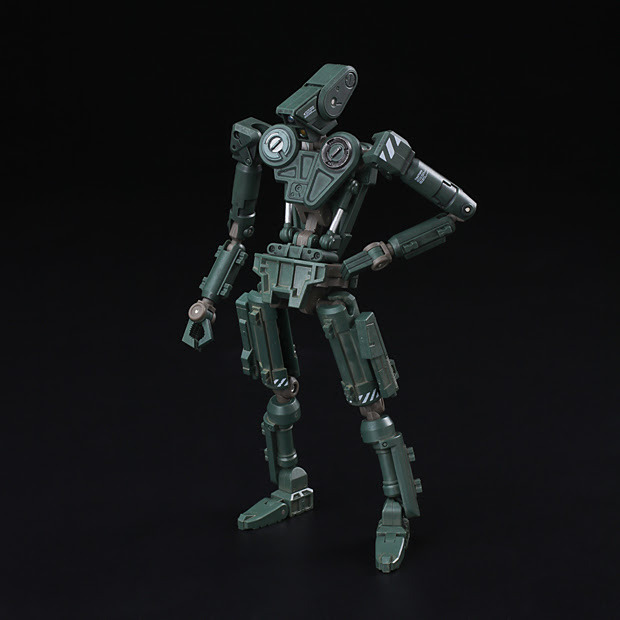 The package is striking with a great shot of Iron Giant posed with his hands on his hips that shows off many of the great features of this figure. 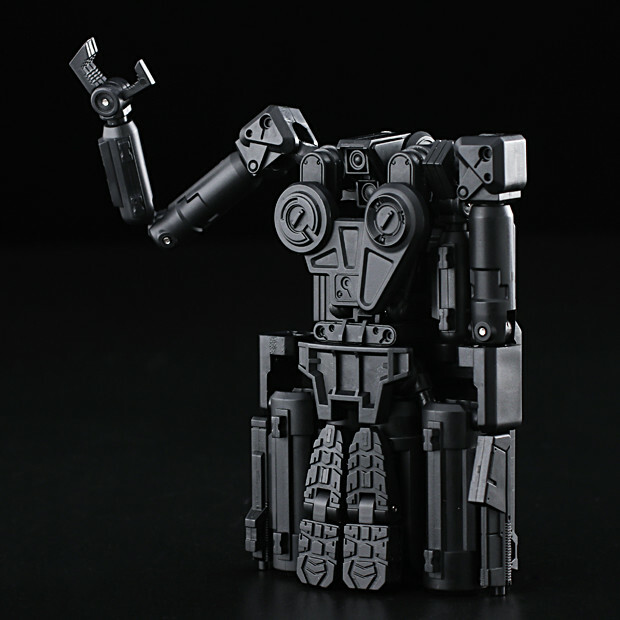 The Iron Giant comes in at 18cm and is composed of a mix of ABS and diecast metal materials. 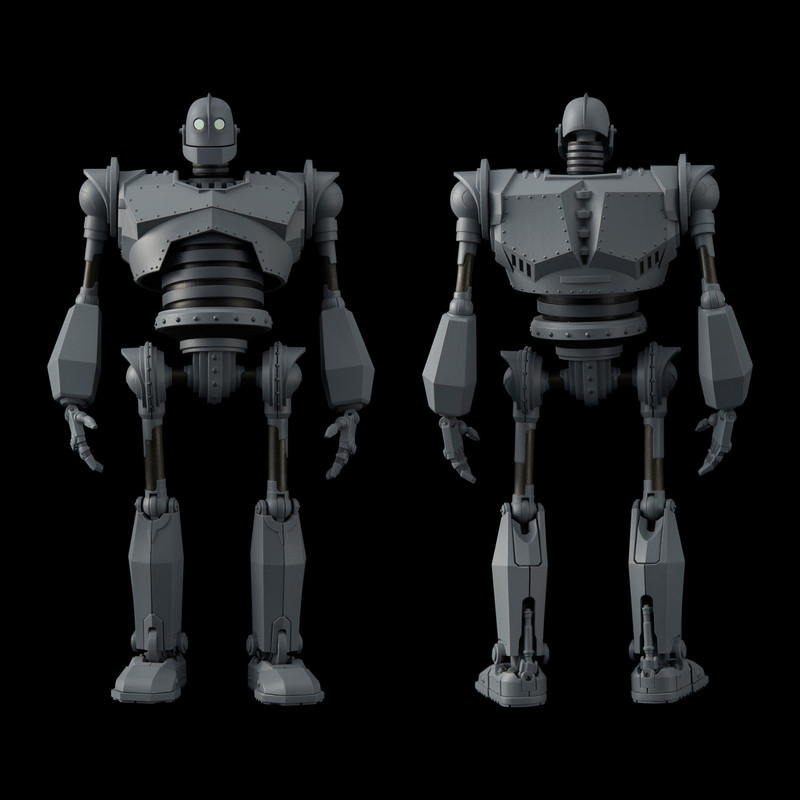 The ABS parts to allow for the faithful recreation of the lovable robot as seen on the big screen while diecast metal has been used for the chest and other bits to give Iron Giant the subtle heft that we love in our robot toys. 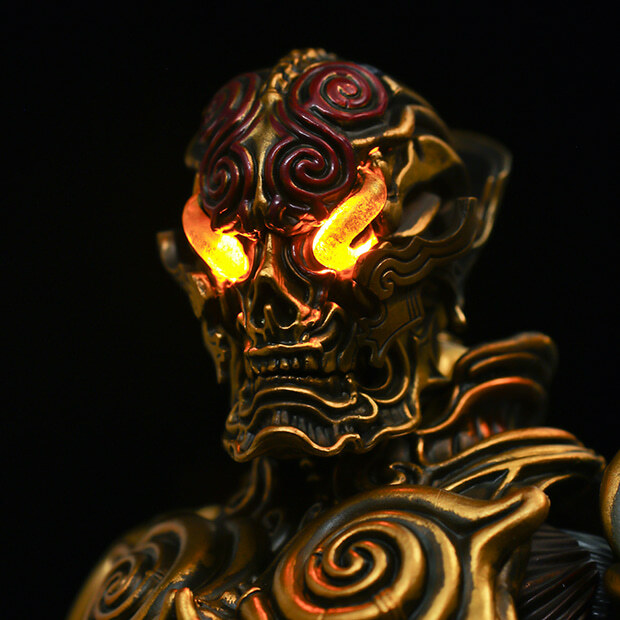 Subtle details in the head design have been faithfully recreated. The mouth lis articulated and can be posed open or closed. 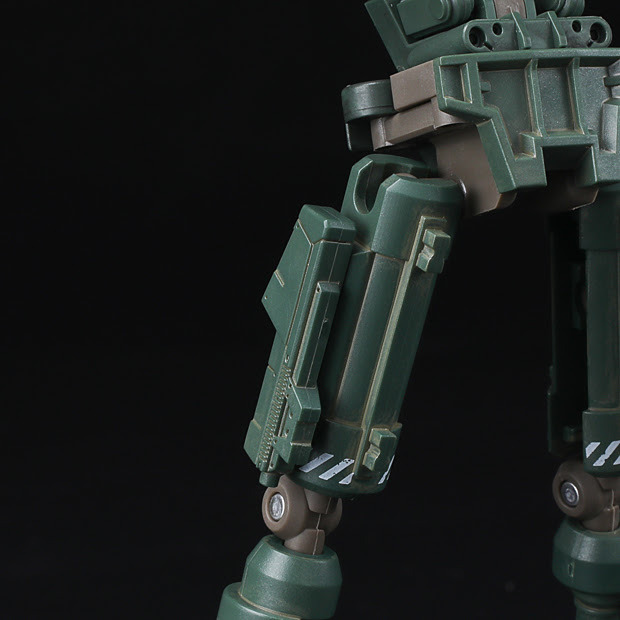 The rivets on the surface have been painted one by one to increase the detail on the surface of the figure. 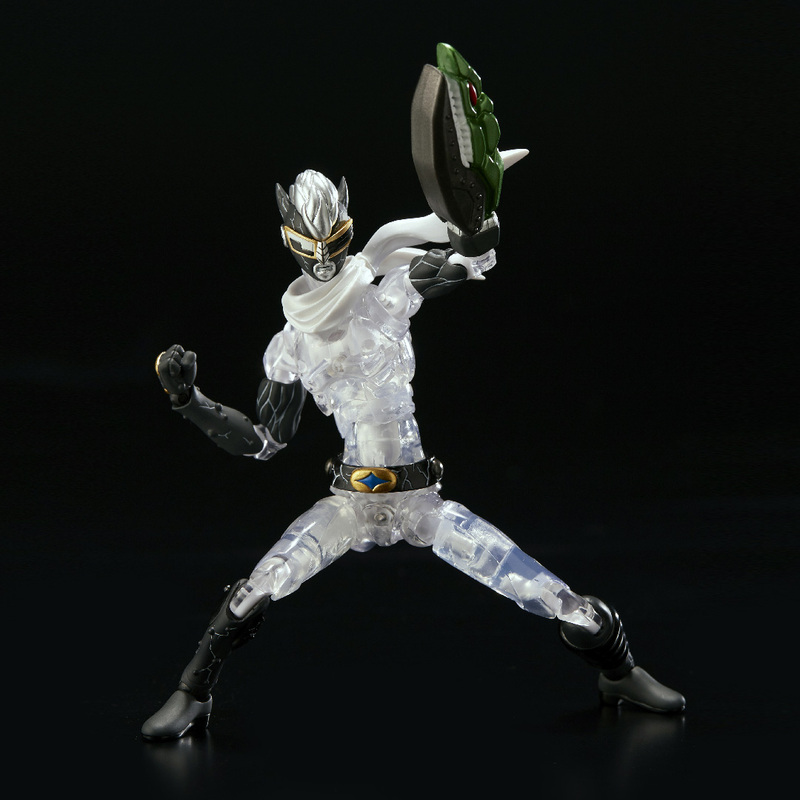 By swapping the alternate heads, you can change his expressions on his face. 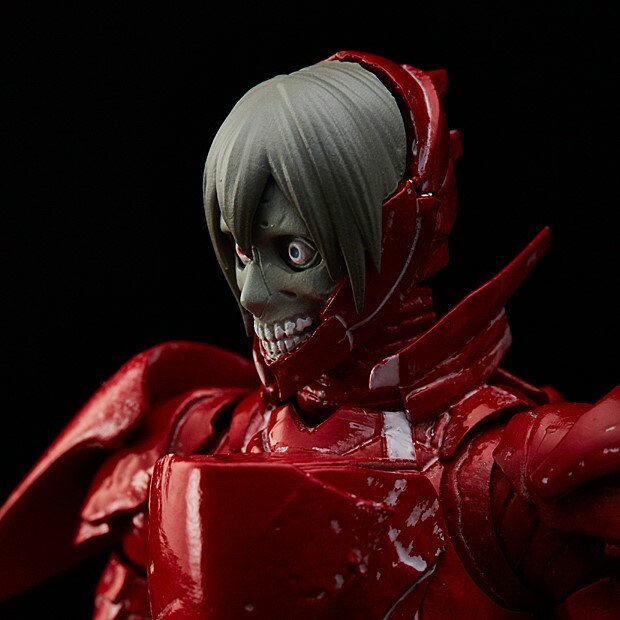 Also by combining the included teeth parts you can make his surprised or angry face even more realistic. LIKE THIS! 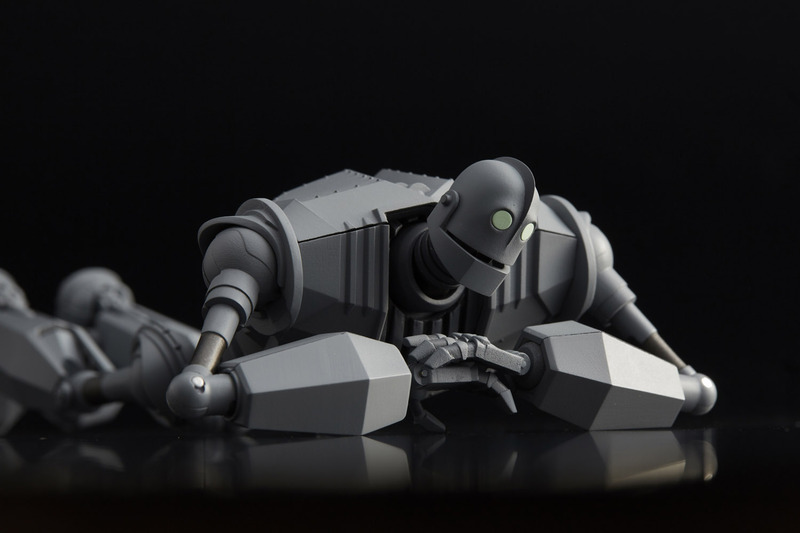 Posing the Iron Giant like this and you can recreate that feeling seen in the movie. By extending his elbow joints the range of motion can be expanded. By pulling out the chest the range of motion in the area can also be extended. 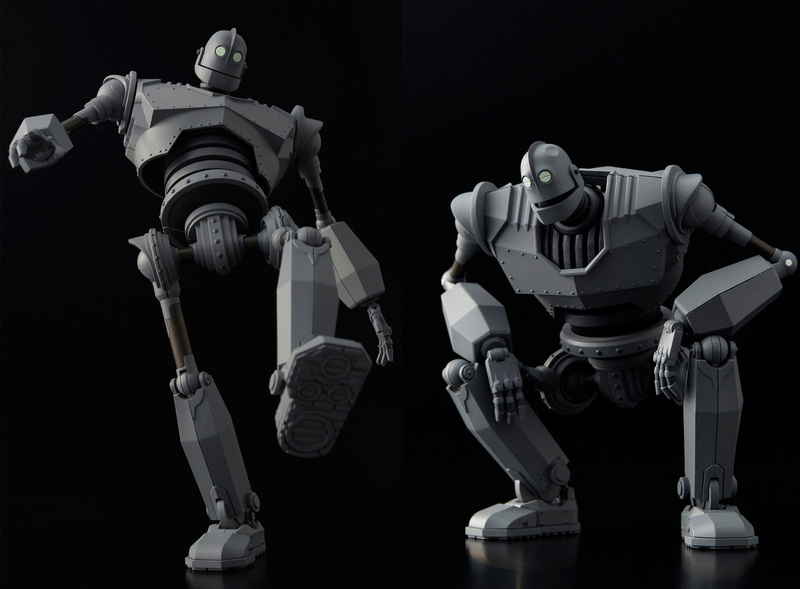 As the overall design itself is spot on so Iron Giant looks great when you put him in simple poses like the squatting pose or just sitting down as in the poses seen above. 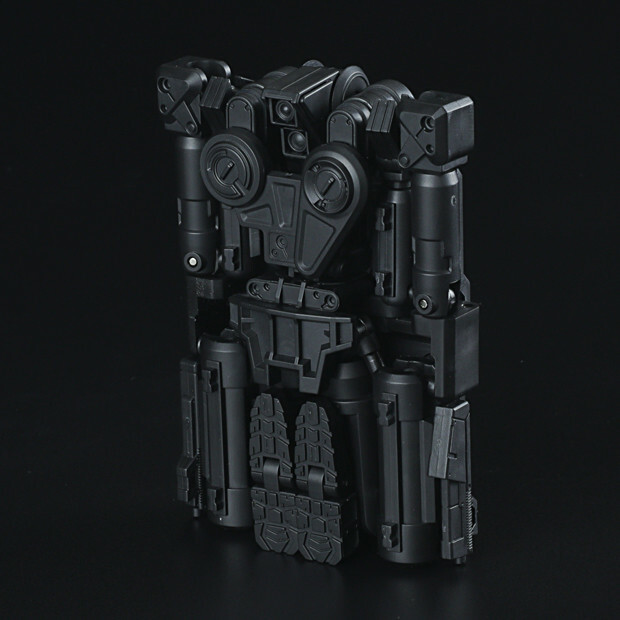 By pulling out the joints as mentioned above you can even have him sit down and hugging his knees! 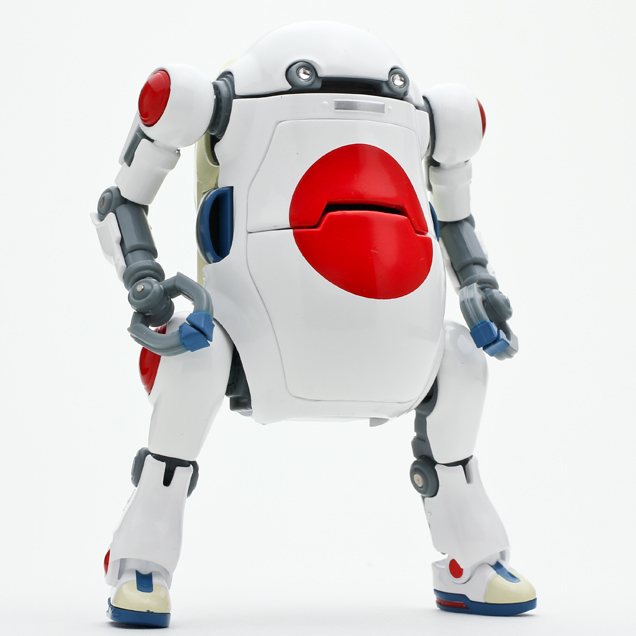 The likable retro design of the robot lends itself to being posed a bit lazily as he does in the movie. 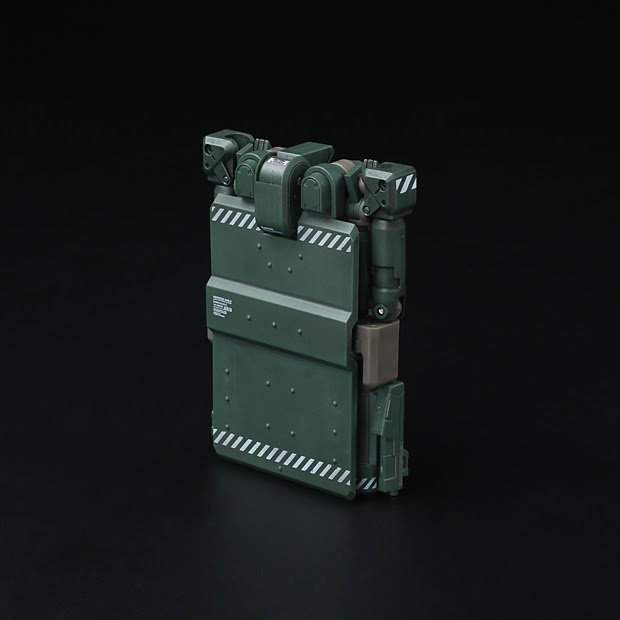 The S mark for the chest has also been included as an optional part and of course can be attached to the chest! Once attached it can be rotated to the preferred angle. So there you have it! 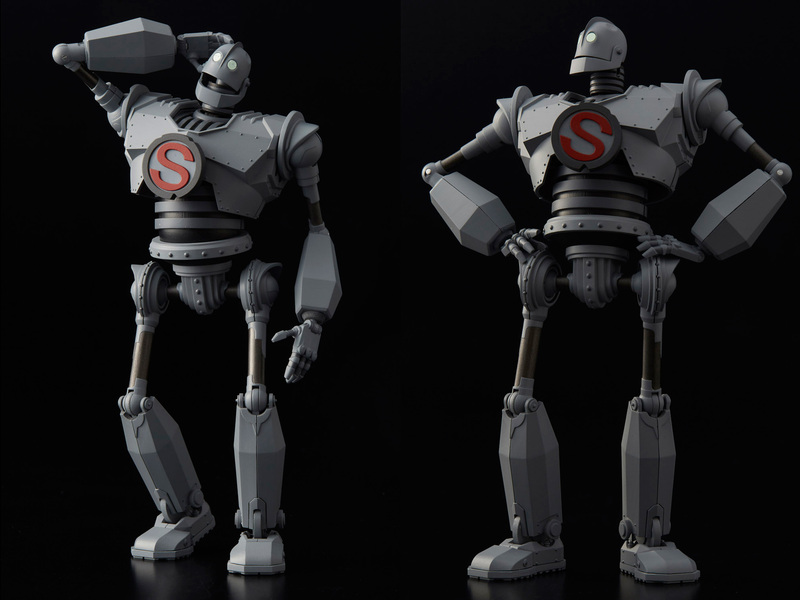 From the classic moving animation “Iron Giant” that brought tears to eyes of many, we are proud to be bringing you our RIOBOT Iron Giant! 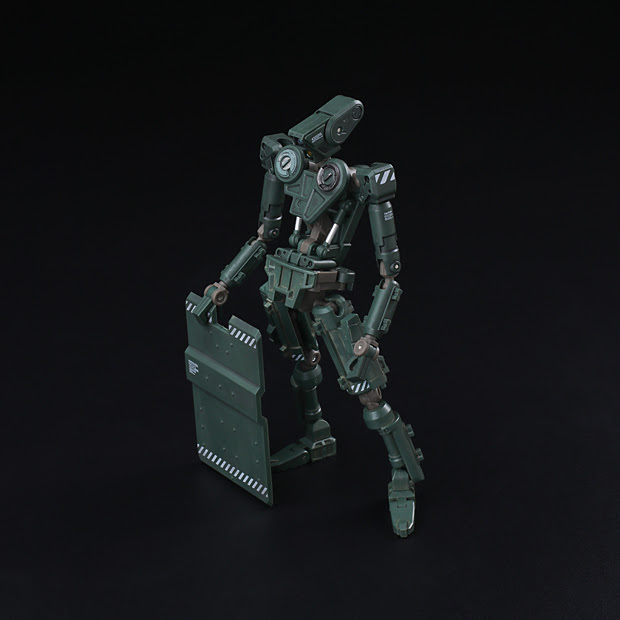 playability and poseability that will become an instant classic. 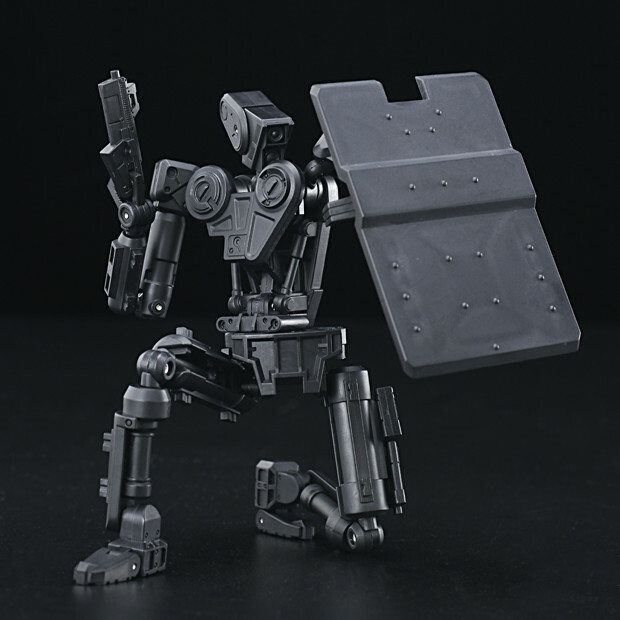 RIOBOT Iron Giant - Defense Mode version is currently in development! 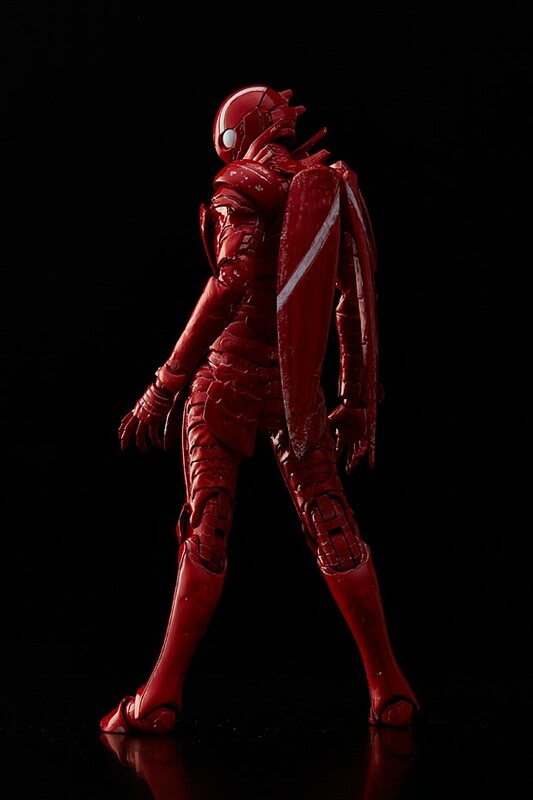 This version will come with red eyes and the right weapon arm as seen in the climax of the movie! Stay tuned for more updates! We would like to inform our customers that 1000toys will be entering a summer break and customer support will be unavailable during the following period. Our business will resume as usual on August 20th (Monday). 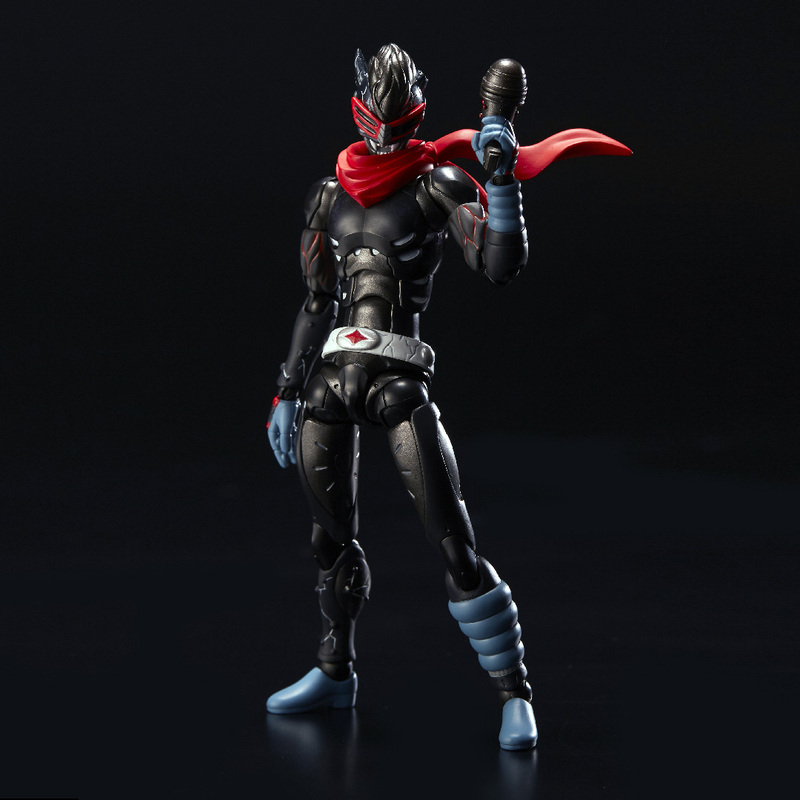 Any inquiries received by the 1000toys customer support during the period above will be corresponded in order of receipt from August 20th (Monday). Please note this will included Facebook messages sent to the 1000toys account. Replies to Facebook messages sent will resume on the same August 20th (Monday) as all other inquiries. Due to the volume of inquiries, please allow for 2 to 3 days from August 20th (Monday) for correspondence to inquiries sent during this period. 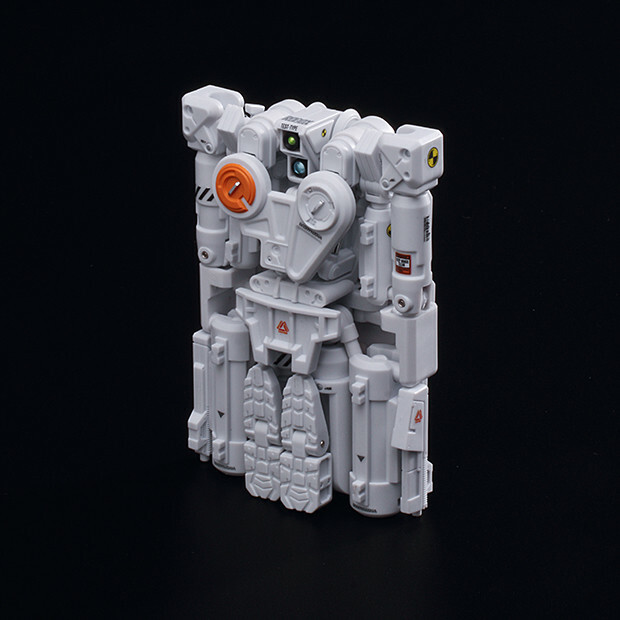 1000toys is happy to announce "Robox Black" which joins "Robox Canvas White“ - as the newest addition to our popular Robox transformable toy series. 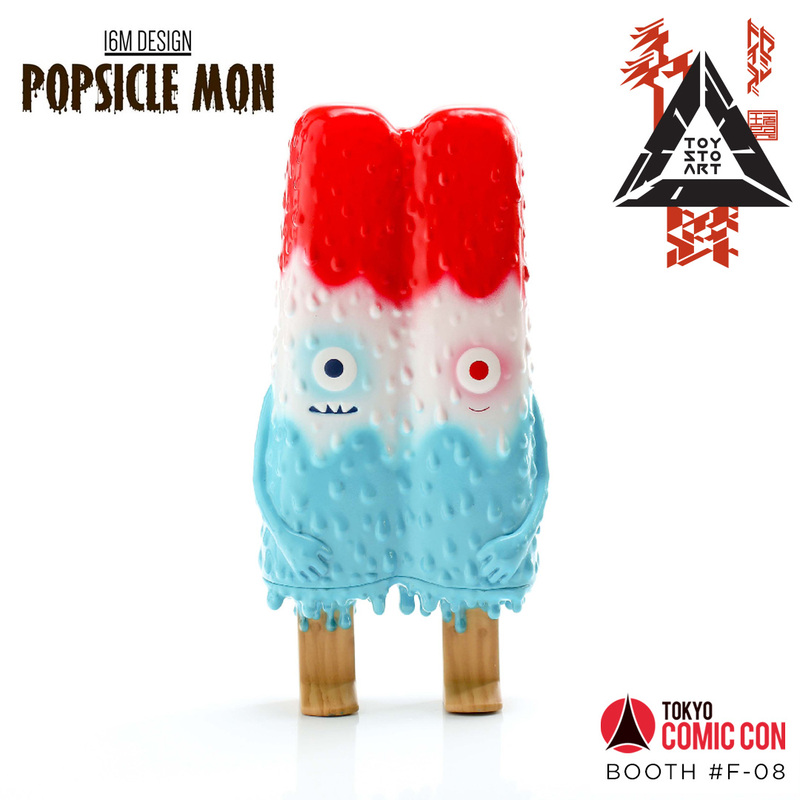 These colorways will be available at upcoming events including San Diego Comic Con, ACG Hong Kong and Wonder Festival! 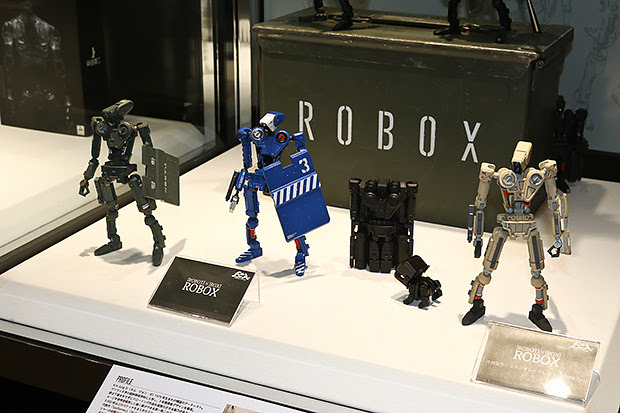 Robox featuring a Kim designed robot that will transform from Humanoid form to a box shape with no exchanging of parts. 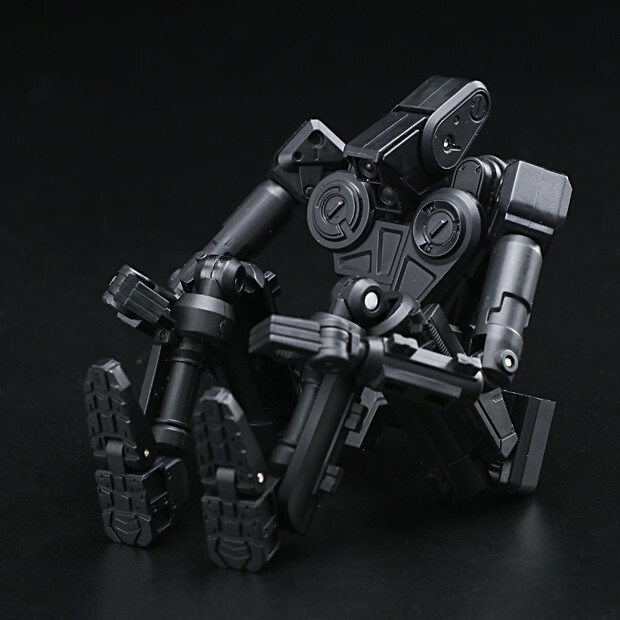 Robox Black will come in a sharp black color. 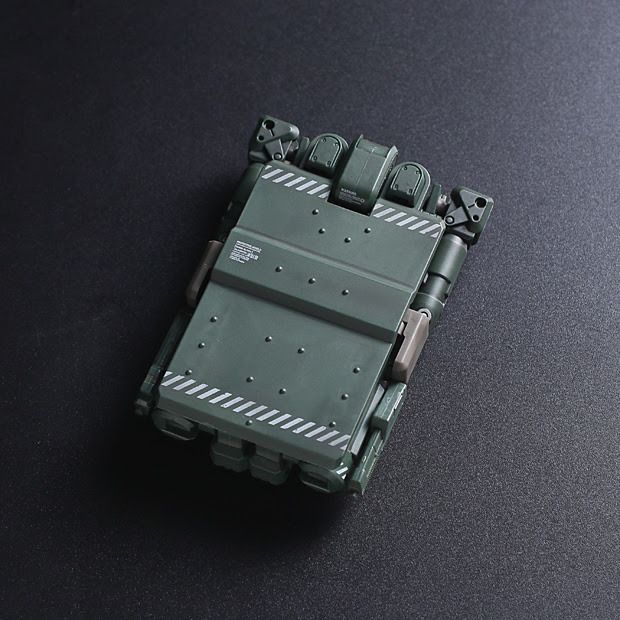 Will not be painted but chic black tone of the plastic will show off the details of the Robox design in a different way compared to the green "Basic Version" released earlier. 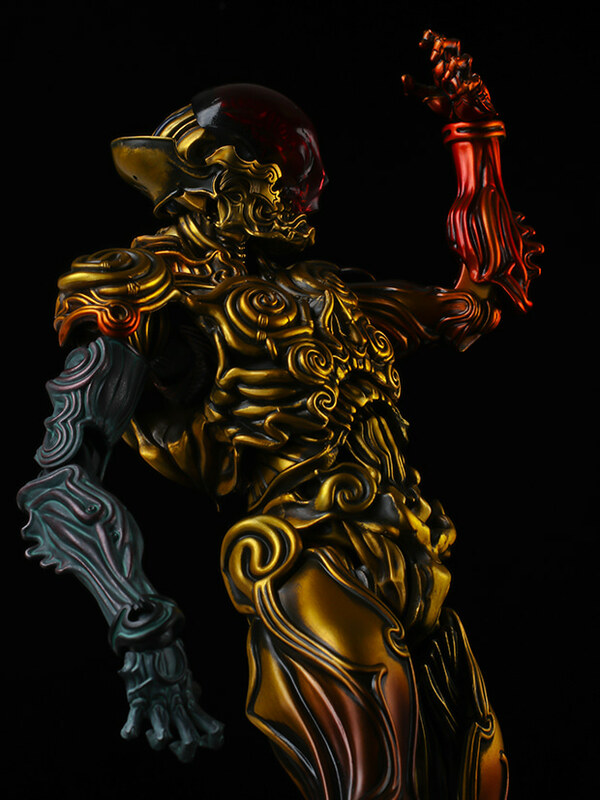 Can be transformed to and back from humanoid and box form with no exchanging of parts. 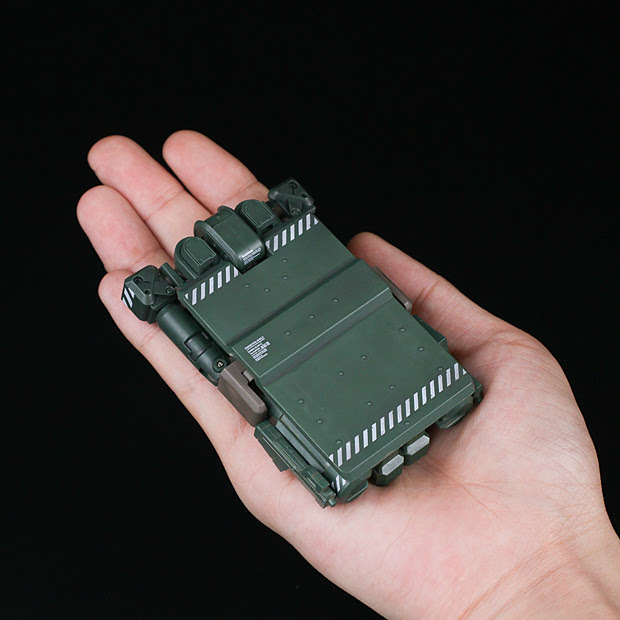 Palm sized and will fit perfectly in most hands allowing you to hold it easily in your hands while you transform it. 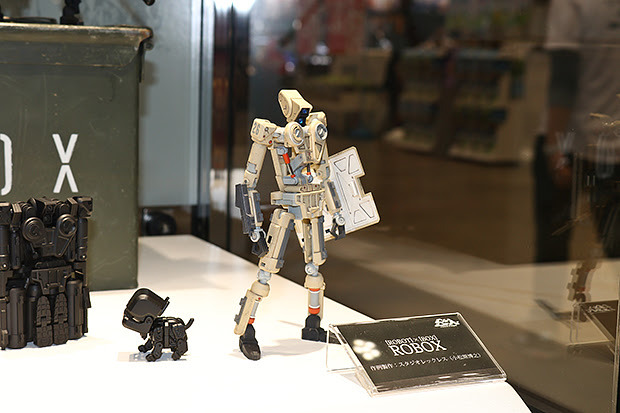 Comes with shield and gun designed for the Robox series. 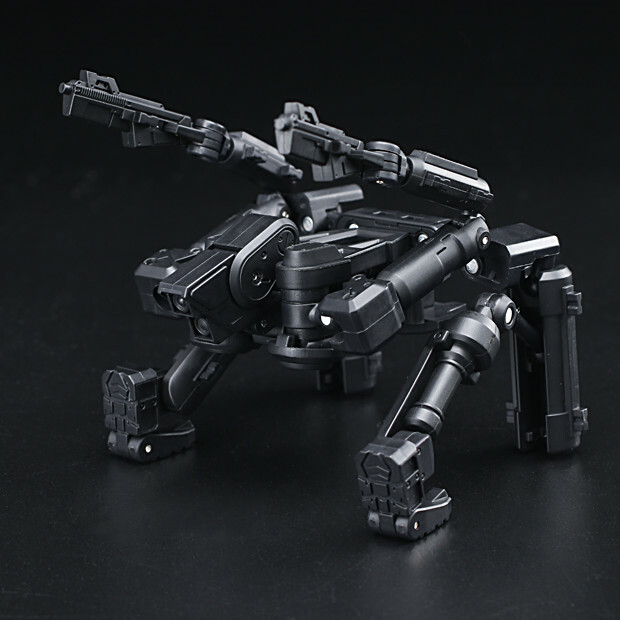 These are designed to be attached to the toy when not in use and do not need to be taken off even during transformation. 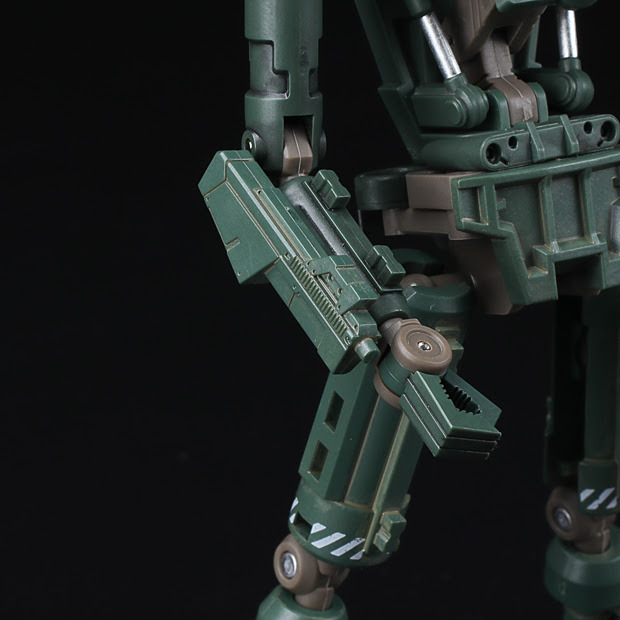 Special attention has been paid to the design of the joints to allow for a wide range of motion to allow you to pose it in ways more seen with an action figure then a robot toy. By creatively using the built in mechanisms it can be freely changed into other shapes and forms. As an example if you want to get really creative you can pose 2 Roboxs like in the picture below where the Robox Canvas White has been changed in to a weapon and held in the arms of the Black version. There are no limits to what you can do with these so let your imagination loose and enjoy the freedom this toy gives you. 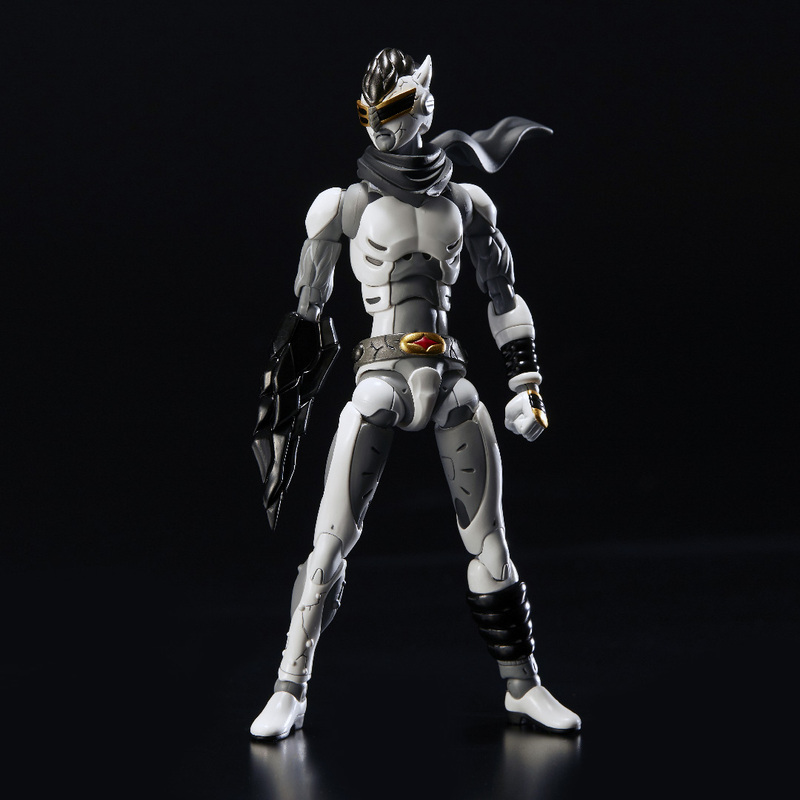 ※Note product will only include 1 toy. You will need to purchase two products to pose them as in the picture. 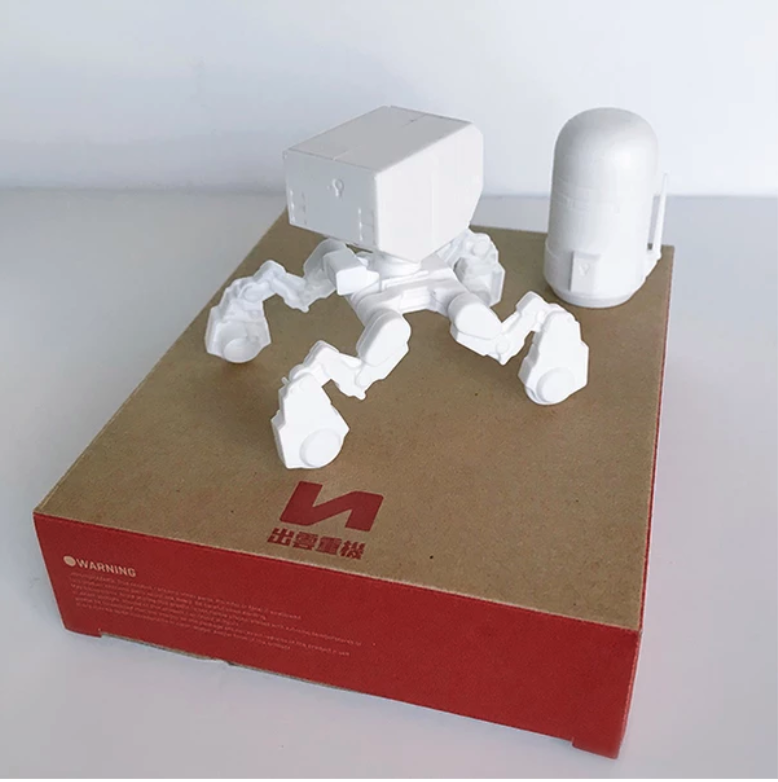 Product will also come with an sheet of original decals that when used on the product will allow you to decorate and design your very own Robox. The decals will add a layer of reality to this and improve the overall feel to it as can be seen on the custom sample below. 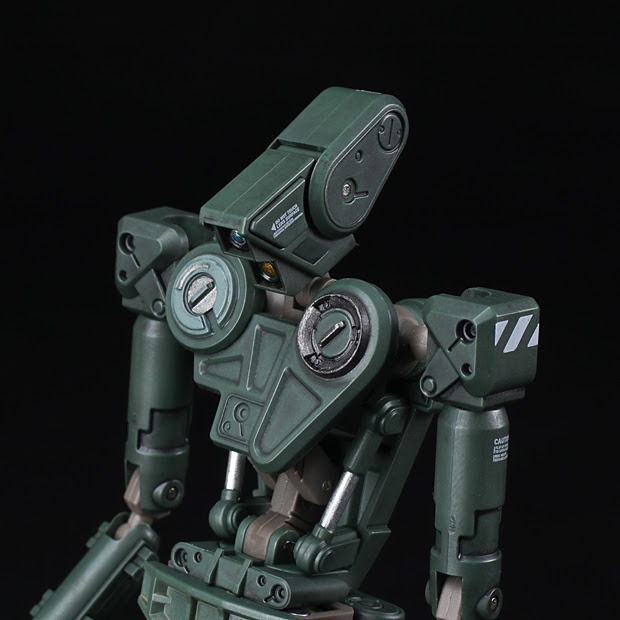 As a example of a custom the type in the picture has the lens painted with decals applied to the white base body. Even this level of simple customization adds details that really sharpens up your Robox so we recommend you try it and make your own Robox. Robox Canvas White will also be available at SDCC! The white colored Robox version originally made for customizers it has become an quick fan favorite wherever it has been made available. 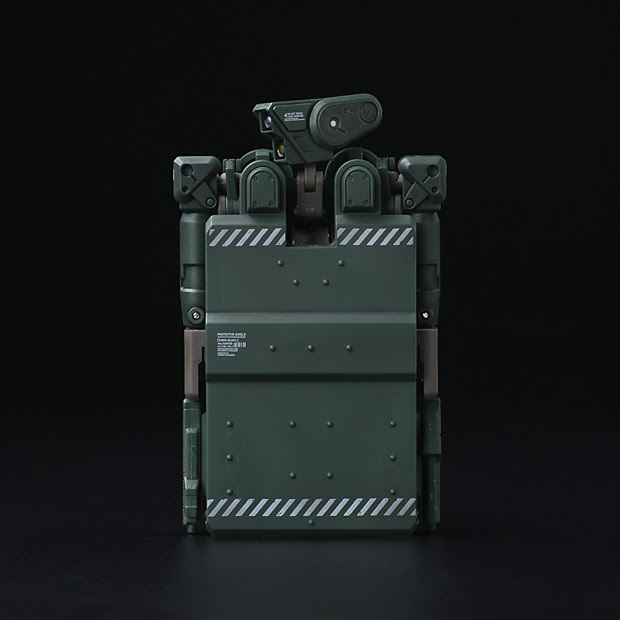 Set will include Shield, 2x guns and Decals. Please check the official website for more details regarding each event. 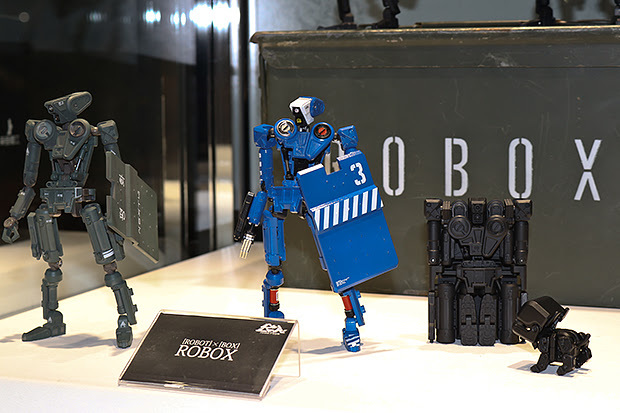 Based on an original design by the world famous Korean artist Kim Jung-Gi, ROBOX is a collaboration between Kim and 1000toys. 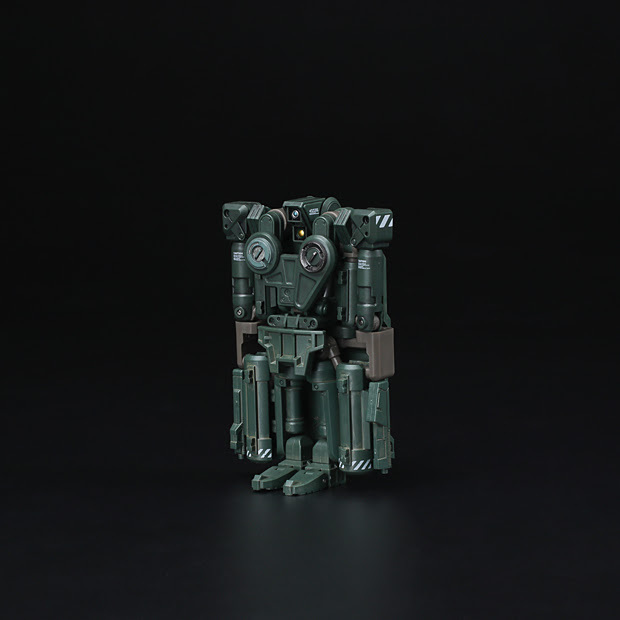 A perfectly transformable toy that comes in a palm sized 1/12 scale with an amazing range of articulation plus the various gimmicks that 1000toys products are known for. Born in 1975 Kim Jung-Gi is a Korean born artist whose style of hyper realistic illustrations without the aid of photographic references has attracted the attention of millions over the last few years. Videos of his live drawing sessions on YouTube have over two million views and he is considered by many one of the greatest illustrators of our time. 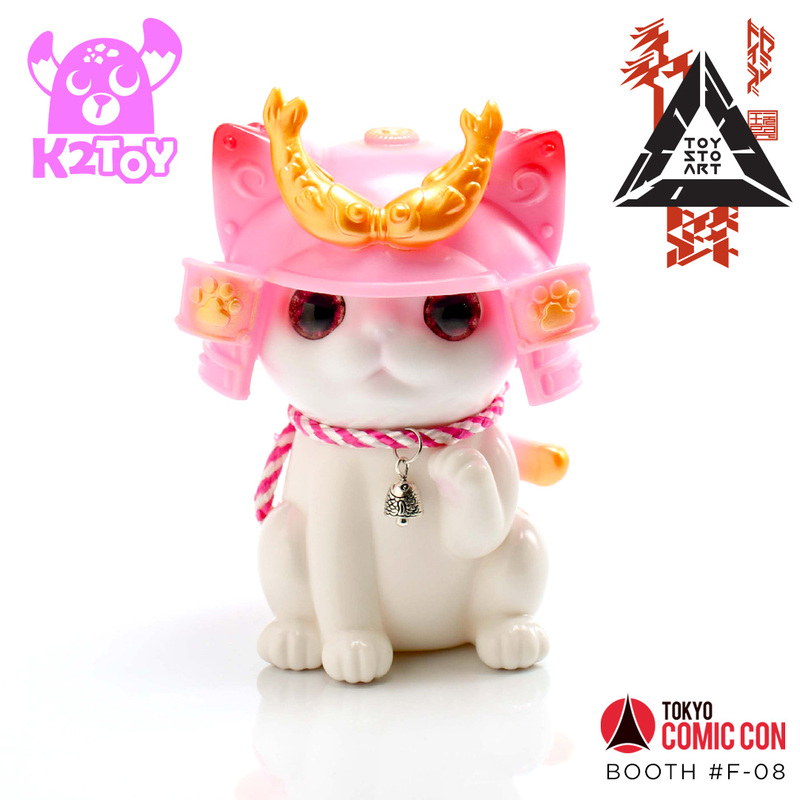 1000toys is once again making the pilgrimage this year to California for the mother of all Conventions - San Diego Comic-Con (July 18 ~ 22). 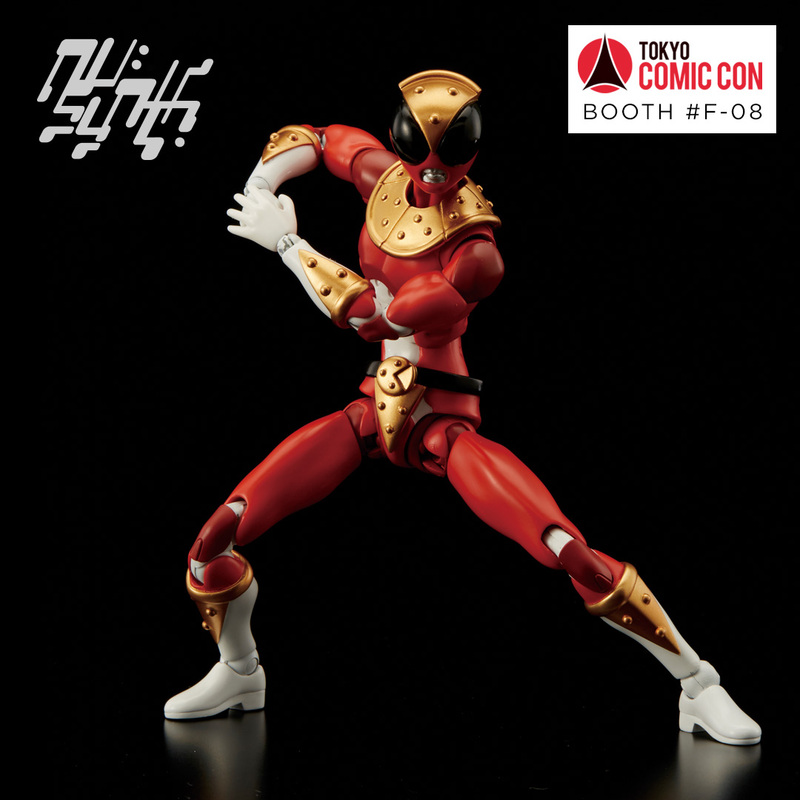 1000toys will once again be hosted by the good folks at 3D Retro (BOOTH #5250) and we will be offering a choice selection of our products. 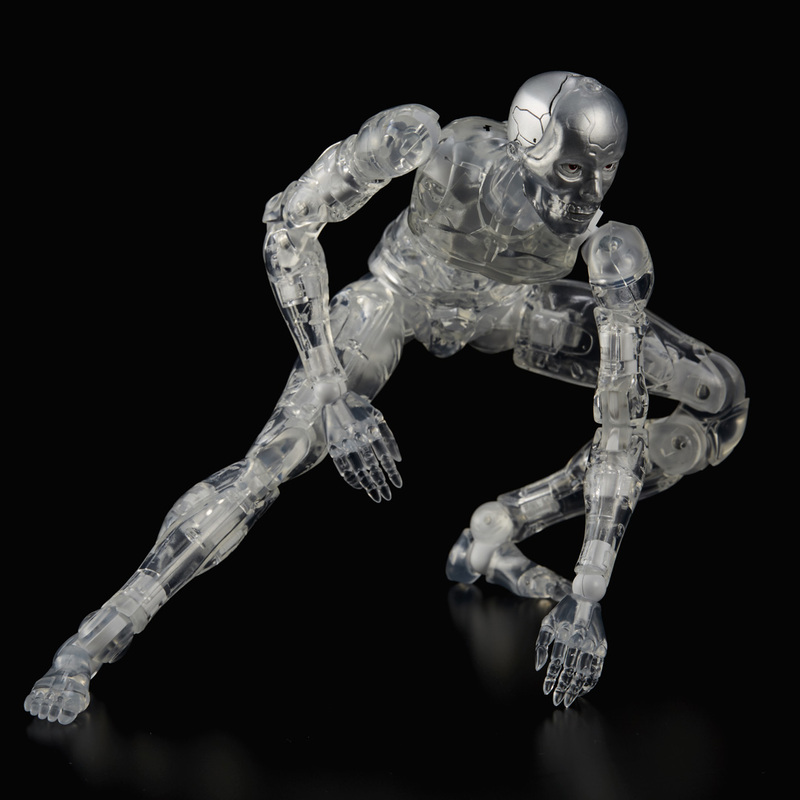 We are excited for the U.S. debut of the TOA Heavy Industries 1/12 Synthetic Human Test Body. 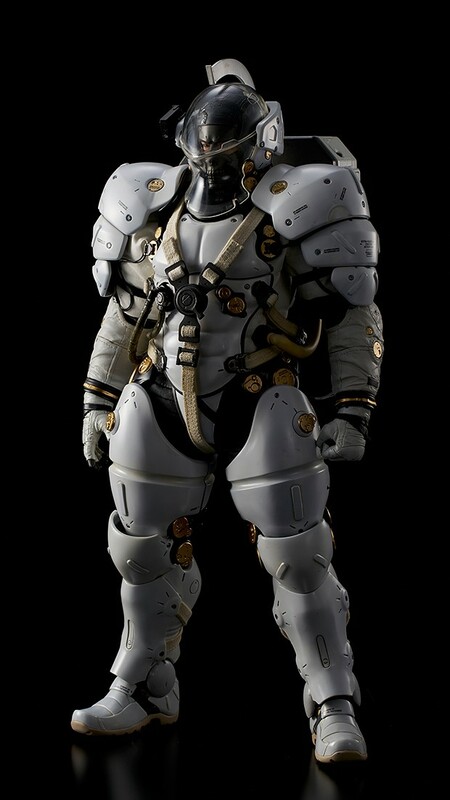 This highly detailed version of our popular 1/12 scale Synthetic Human is sure to be a collectors item. There will be a limited number of Test Bodies available each day of the show (excluding Sunday) and purchase will be strictly limited to 1 piece per customer per day. For more details please check our blog post about the product. 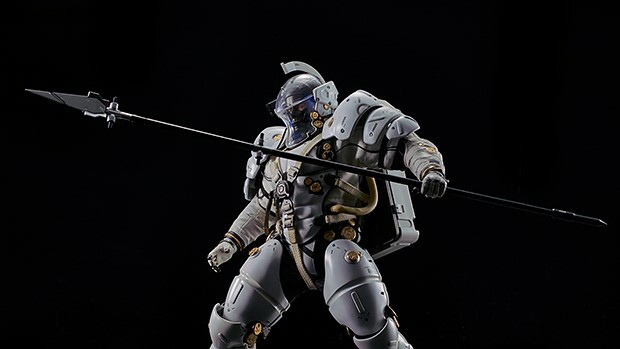 There has been a lot of excitement around this release and we have heard the concerns of some of our fans regarding this figure’s event exclusivity. While there is currently no plan for an online release, we are taking the feedback into consideration. Please stand by for further announcements and thanks for your enthusiasm and support. 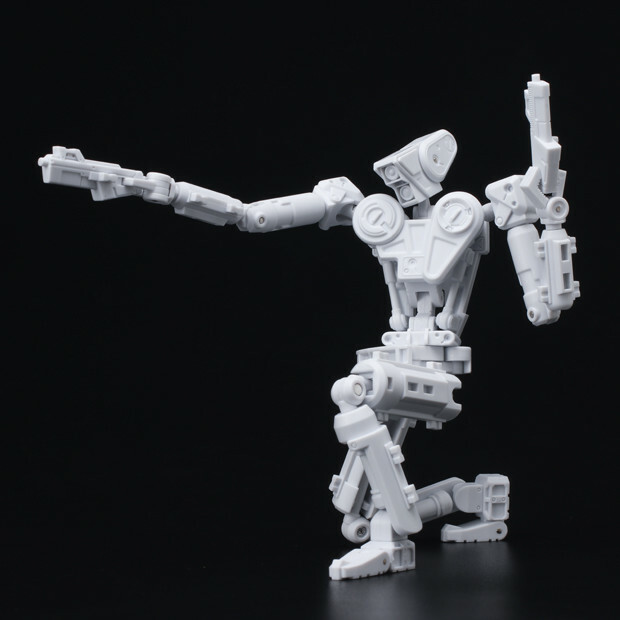 Also available will be ROBOX - our recent transforming robot collaboration with Korean illustrator Kim Jung-Gi! 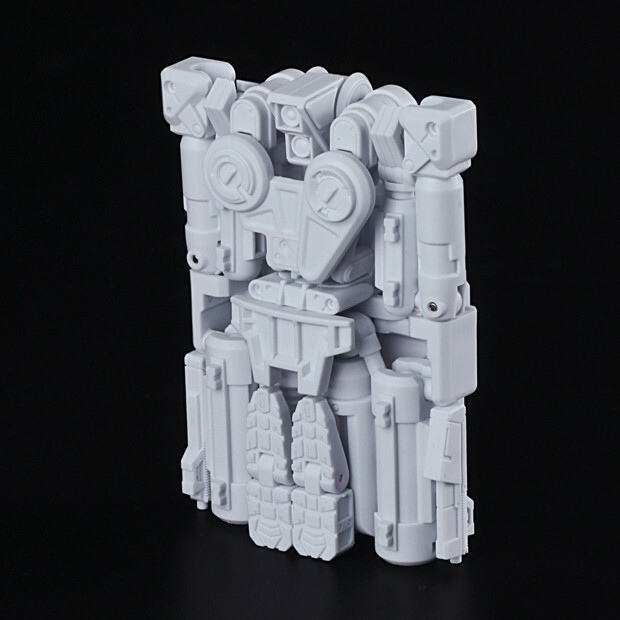 ROBOX will be available in TWO unpainted event exclusive colors - CANVAS White and Black - a customizers delight. 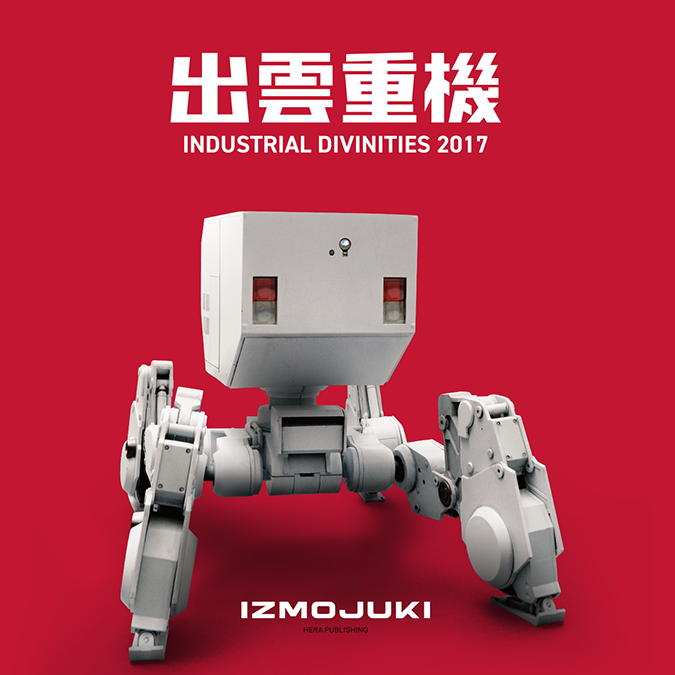 From Japanese Mecha innovator IZMOJUKI - we will have copies of his recent book Industrial Divinities 207 plus 1/35 scale SIMPLER plastic model kits of the PROBE 20WT available for purchase. 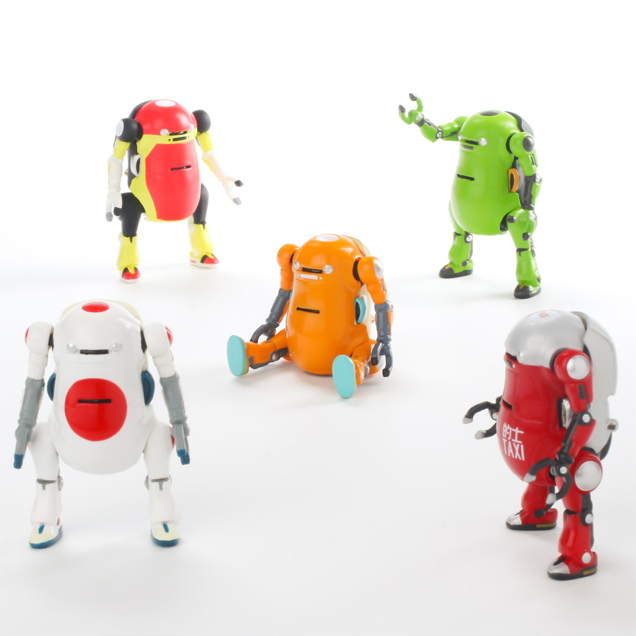 THREE styles of everyone’s favorite little robot the MechatroWego will make their Comic-Con debut - America, Hinomaru (Japan) and Tokyo plus the brand new Tiny WeGo Blind Box series. There are five different designs - Collect them all! Additionally we will also have all 3 versions of the Next Man Synth from the nu:synth initiative - Fusion, Future and Cyclone. 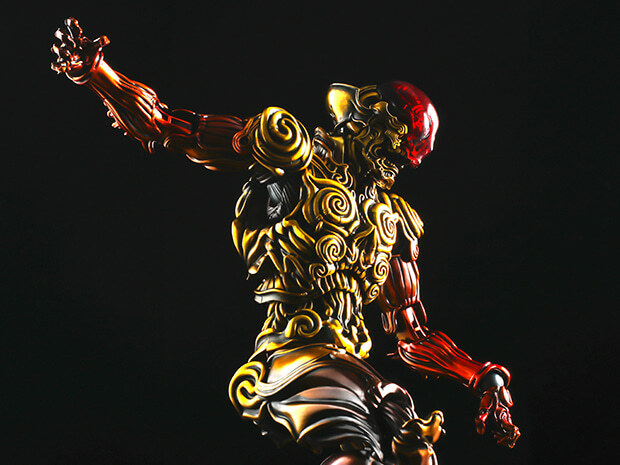 This 1/12 scale series of artist collaboration action figures is based on designs by Japanese soft vinyl designer Mori Katsura of RealxHead. 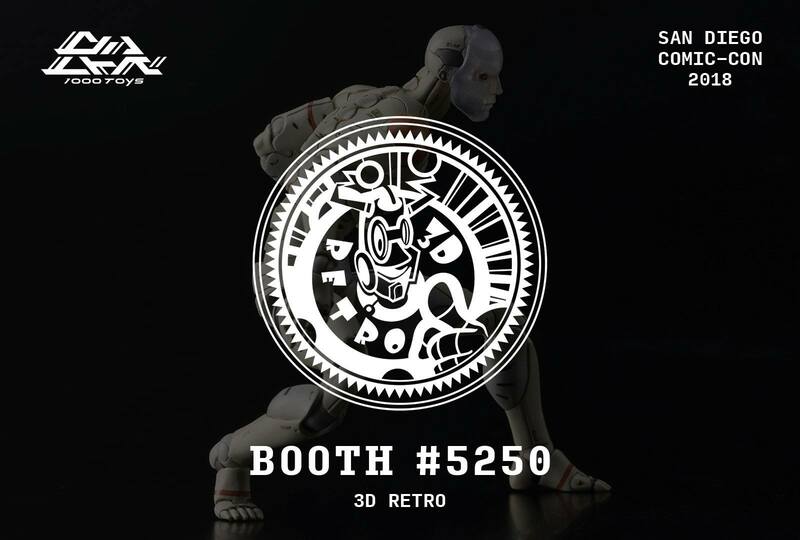 We are looking forward to seeing all our fans and friends - please stop by 3DRetro Booth #5250 and say hello! 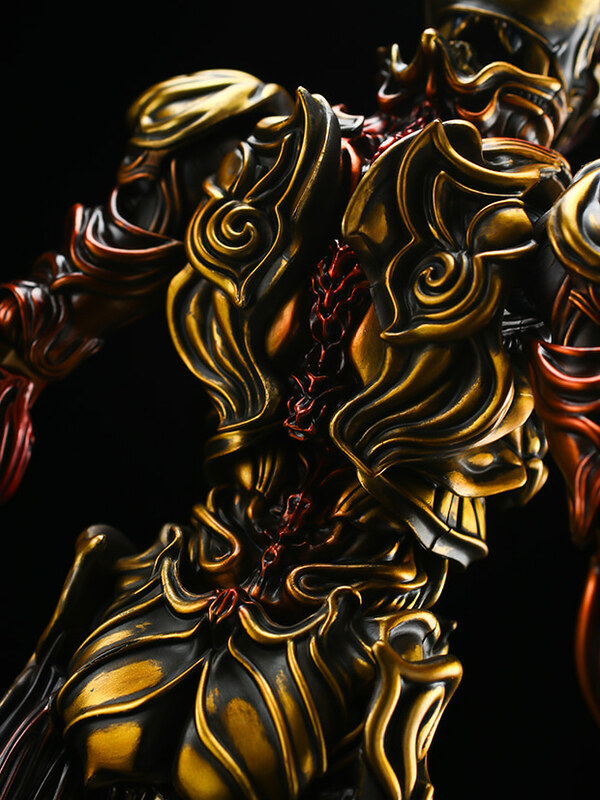 As we will start preparing the delivery for the following item to ship in mid June 2018, we ask our customers to please login to your 1000toys account and double check if the delivery address requires any revisions. 2) Register a new delivery address from "Address Book" at Account Settings. 3) Click your "Order History" to show order details. 4) Click the red Order No. of the order you wish to change. 5) Scroll down and click “Change Delivery Destination” to replace the old delivery address with the new delivery address. 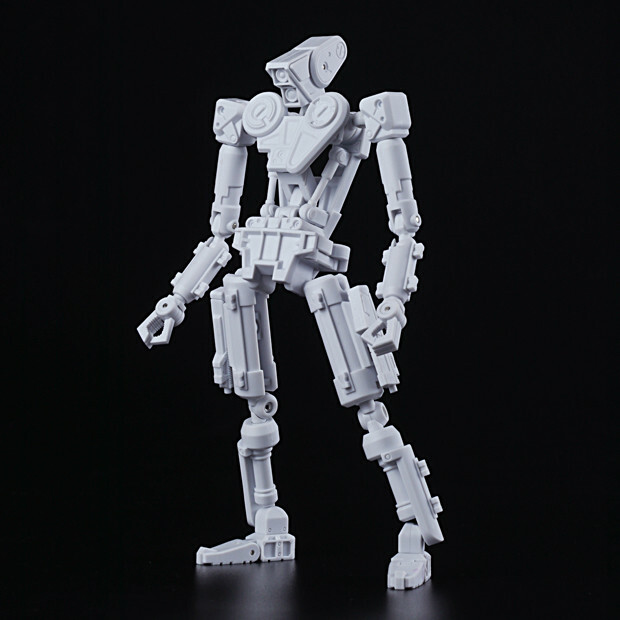 1000toys is excited to unleash NextMan Synth Cyclone, the latest figure from the nu:synth initiative. 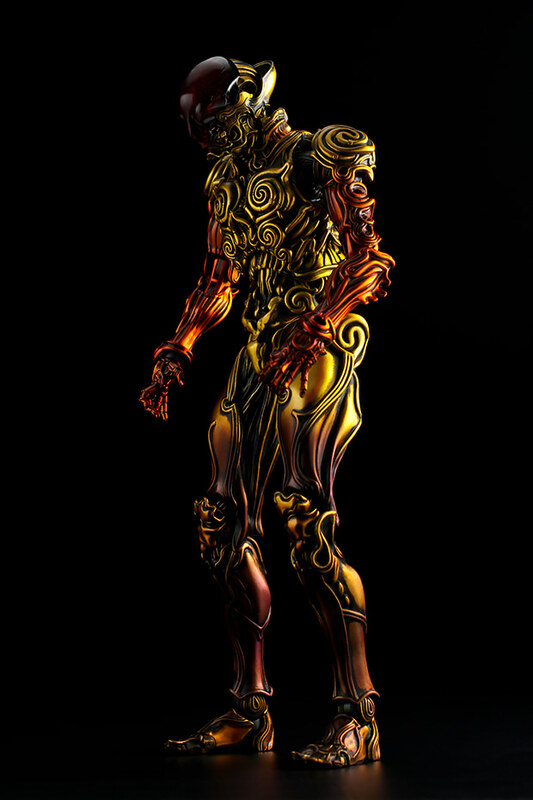 Each NextMen Synth - Cyclone, Fusion and Future - features a unique head sculpt and different weapons. 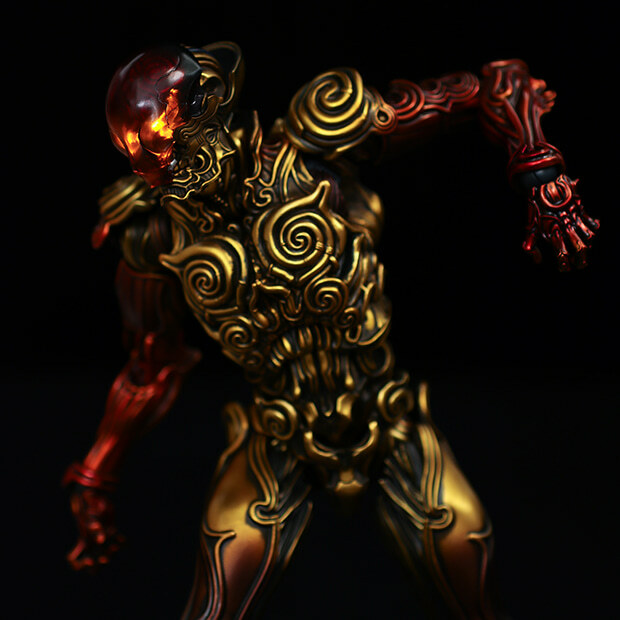 NextMan Synth Cyclone will see his U.S debut at the upcoming Five Points Festival at 1000toys Toys-to-Art Showcase Booth #539. 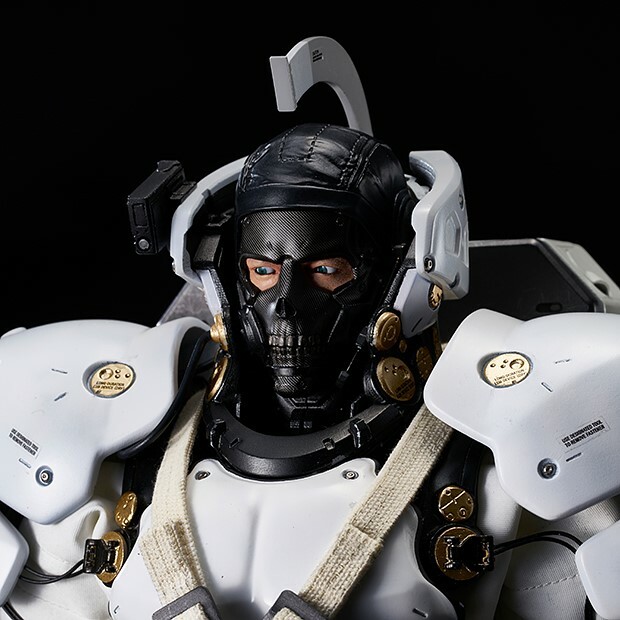 All three 1000toys x RealxHead NextMan Synth figures will available worldwide through select retailers in Summer 2018. Stay tuned for breaking news regarding upcoming releases in the dynamic nu:synth initiative line and thanks for your support! 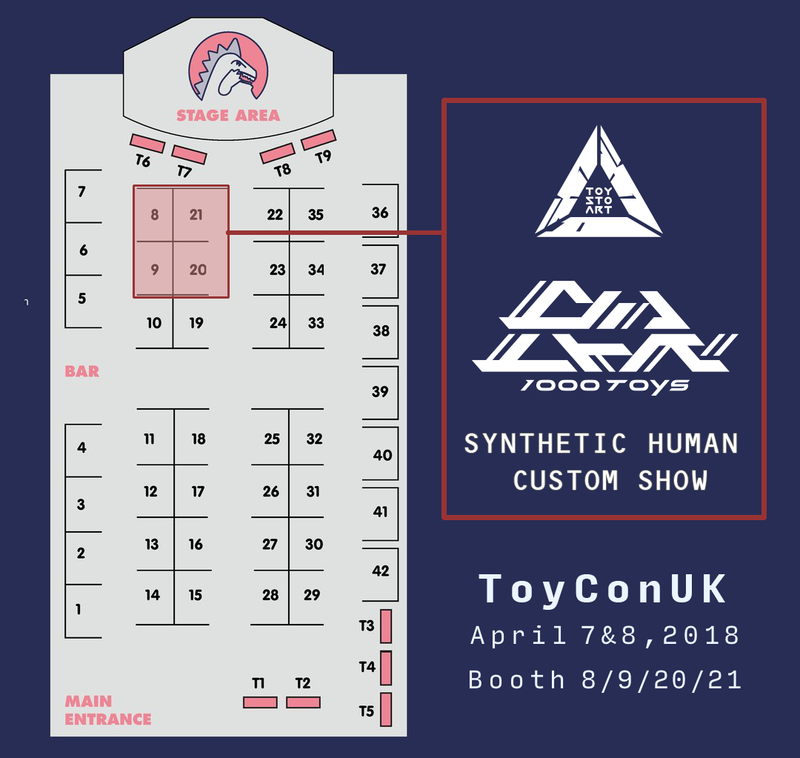 1000toys is happy to announce that we will be back in London for ToyCon UK 2018 at York Leisure Centre in Bethnal Green, London on April 7 & 8, 2018. 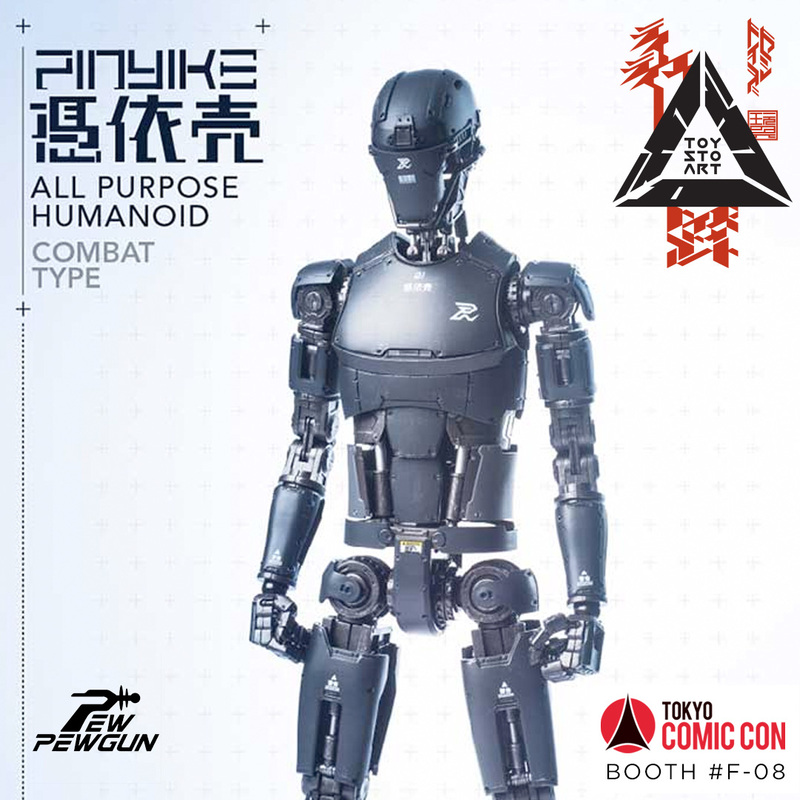 This will be our third time at the show and we are bringing some hot new products plus the latest installment of the Synthetic Human Custom Show as well the spectacular Toys-to-Art Showcase featuring 3 of our favorite Art Toy creators. 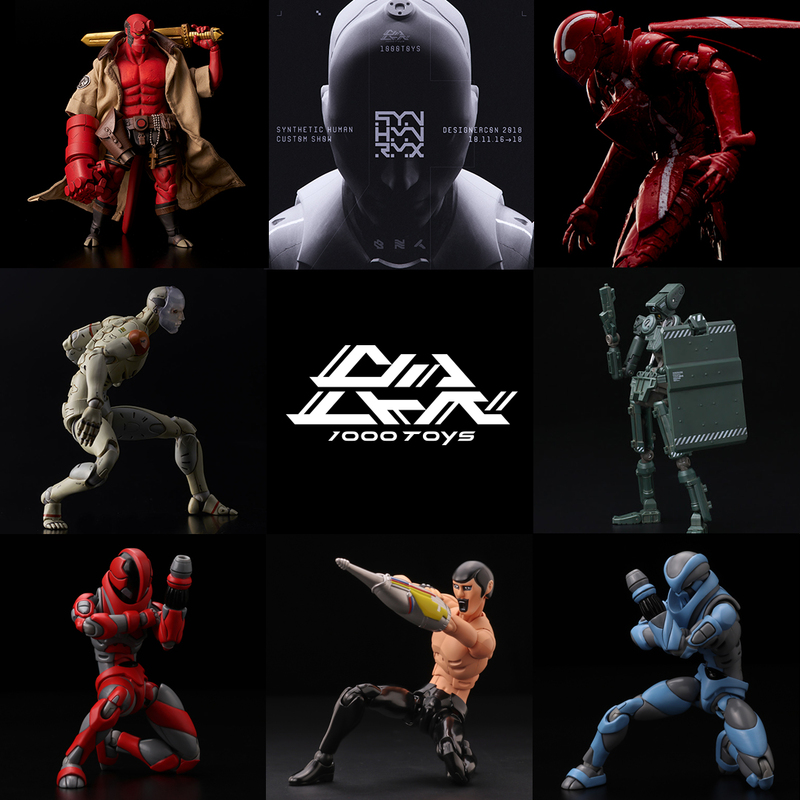 This year a choice selection of 1000toys products will be available including all 3 versions of Next Man Synth - our collaboration with Japanese toy maker Real x Head from the nu:synth initiative series. 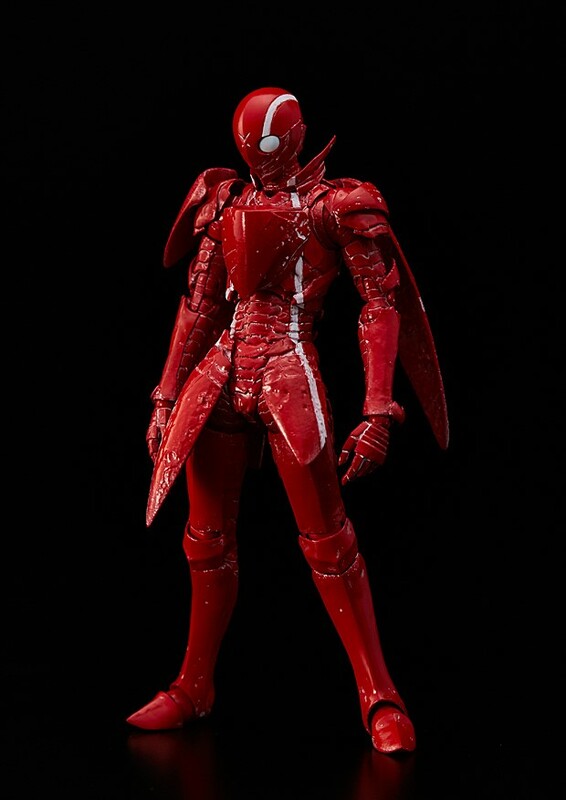 This will mark the worldwide debut release of Cyclone version as well as the first international release of Future version. 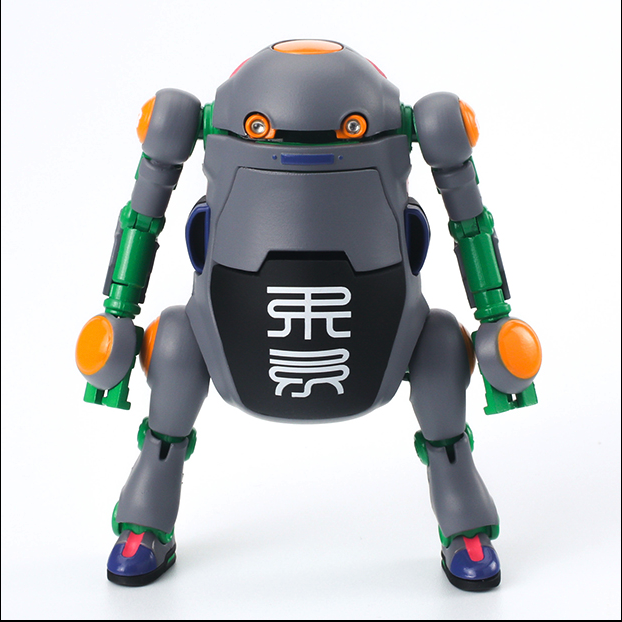 Also look out for some new Mechatro WeGo designs and other surprises. Stay tuned for the full product list. We will also be bringing the latest installment of our traveling Synthetic Human custom show. We have had an amazing cadre of international artists create unique works using our signature ? 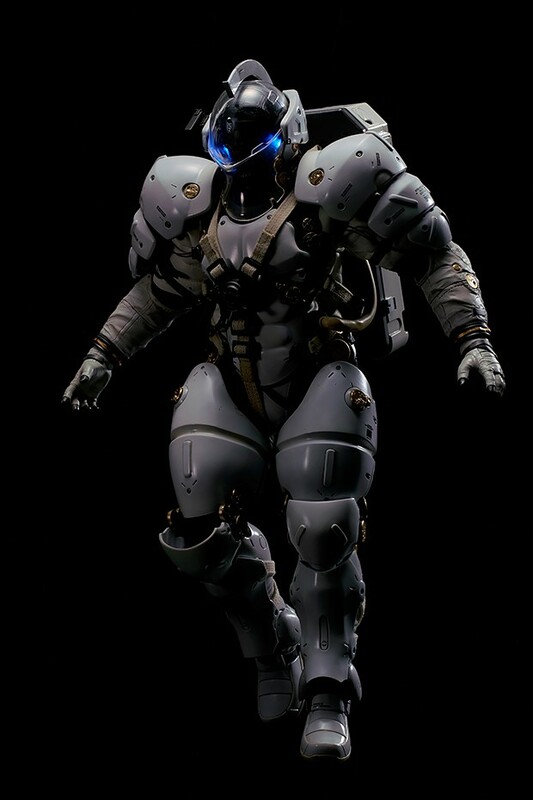 scale Synthetic Human as the base platform. 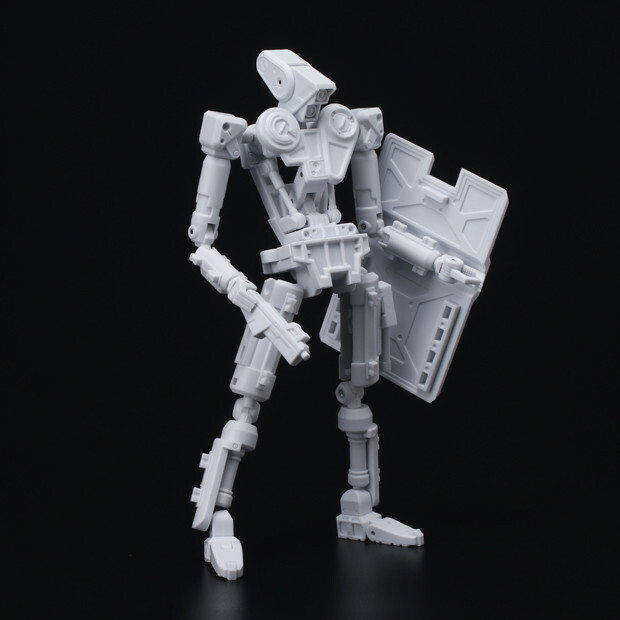 Look forward to checking out customs from Scott Tolleson, Doktor A, Acid Rain, Atom A. Amawrestler and many more. 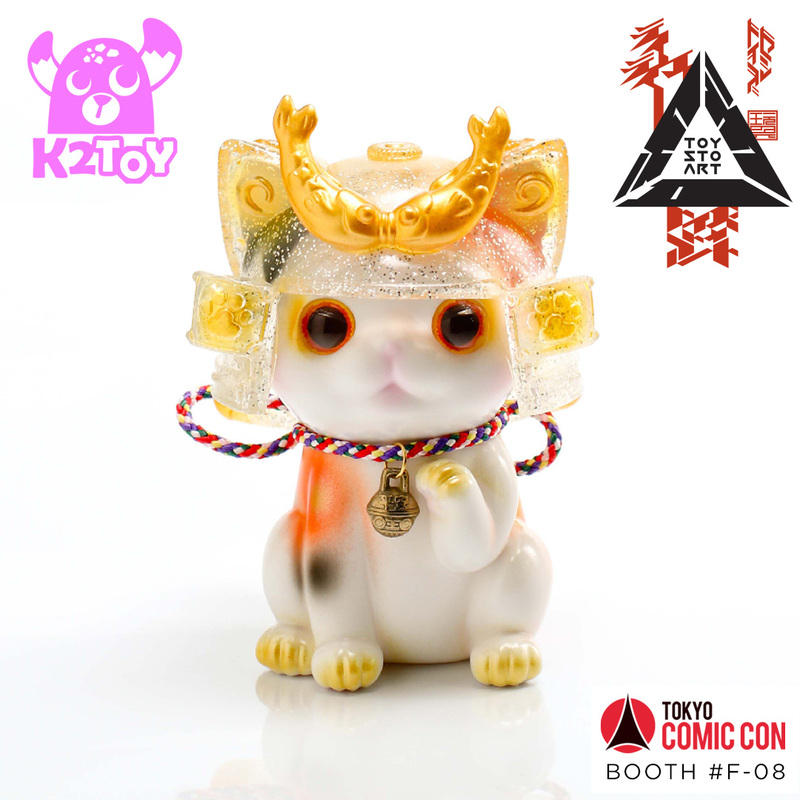 For the Toys-to-Art Showcase, 1000toys will be sharing our booth space with 3 very talented artists; Kaori Hinata (Hinatique), Deanne George (Sorbet Jungle), Yasu (Ebineko-ya). The amazing team of original Art Toy creators who will be doing live painting, signings and offering up custom toys and original artworks as part of the showcase. 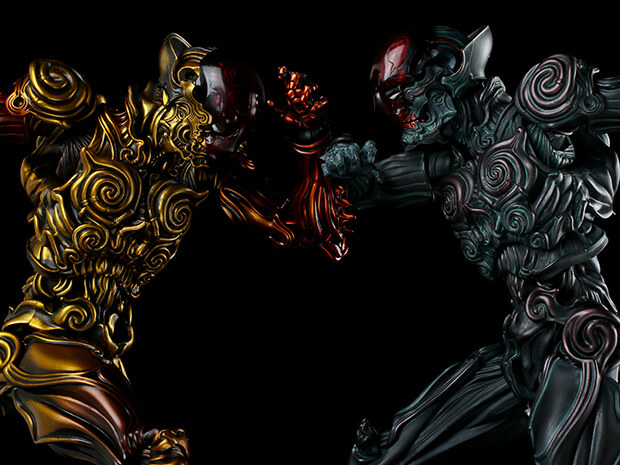 PLUS there will be exclusive Toys-to-Art vinyl releases. 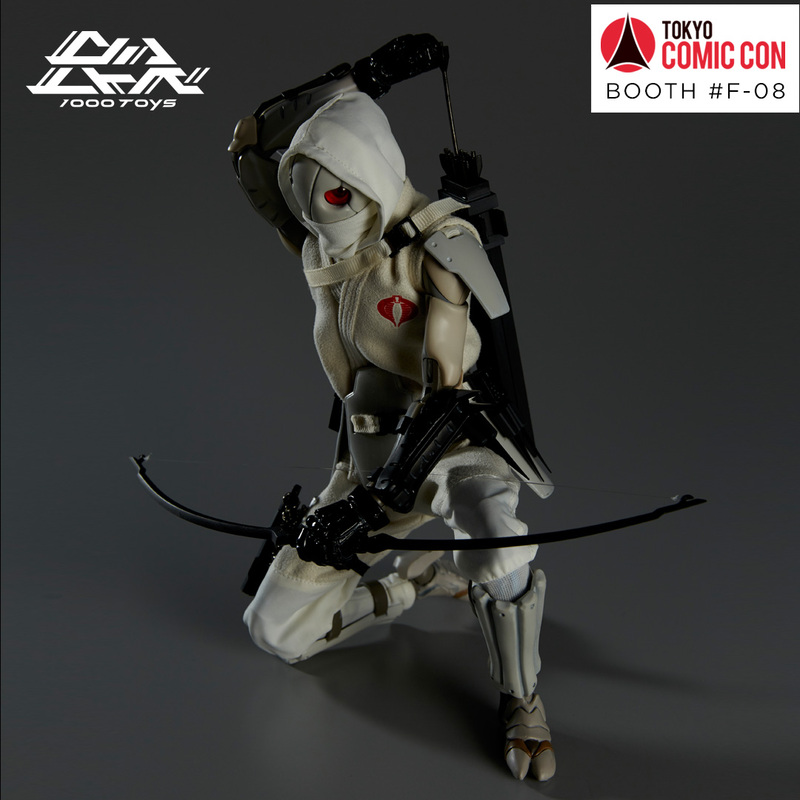 Follow 1000toys on Facebook and Instagram to get the latest updates as we count down to ToyCon UK 2018. 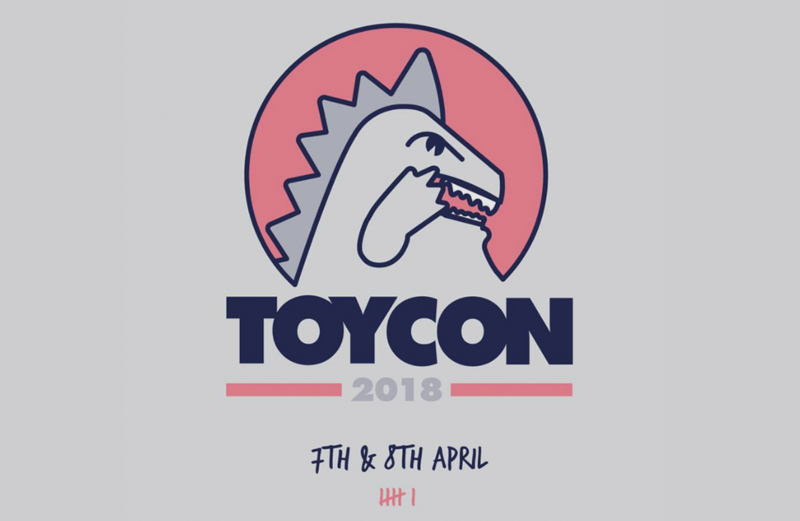 ToyCon UK is the UK's only dedicated designer toy convention, celebrating our 6th year in 2018! Visit www.toyconuk.com for ticket information as well as more information on the event. 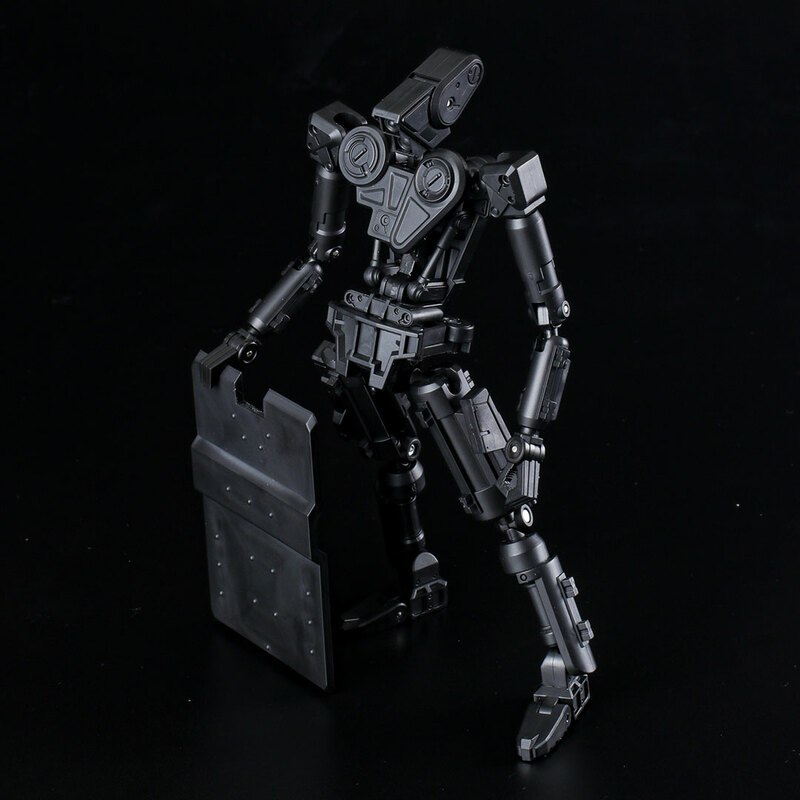 1/12 Synthetic Human 3rd Production Run! Back by popular demand! 1000toys is happy to announce we will soon be opening of pre-orders for the third production run of the 1/12 scale Synthetic Human. 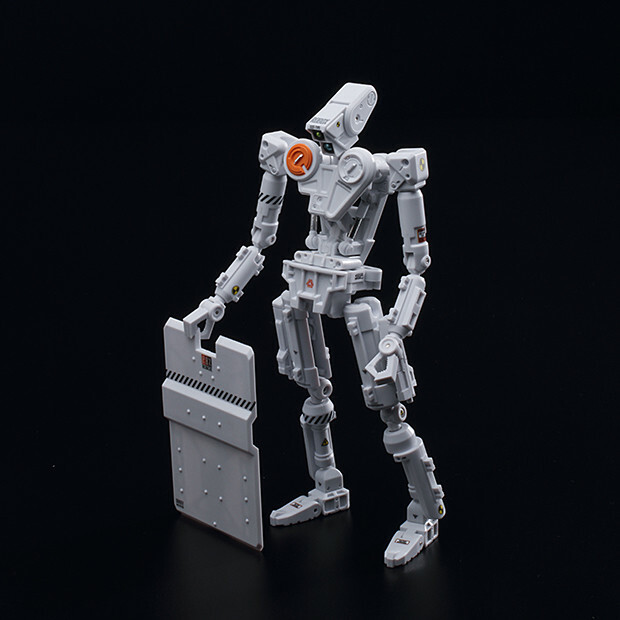 A marvel of groundbreaking engineering, this articulated masterpiece will once again be available! 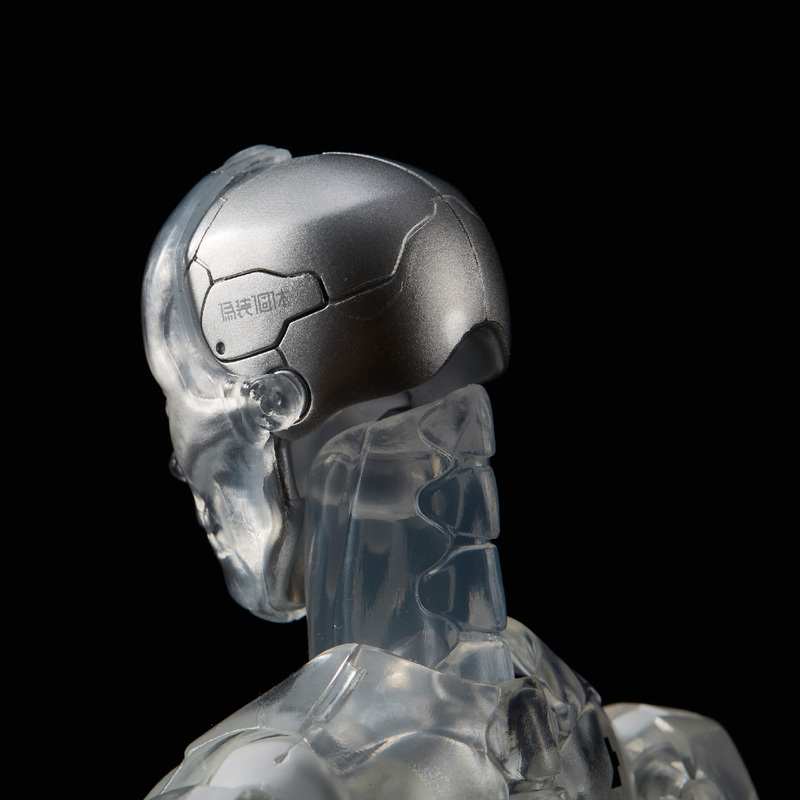 The 3rd edition will have a unique identifying mark added to its cervical spine to distinguish from the previous runs. It will be identical to the previous releases in every other aspect. 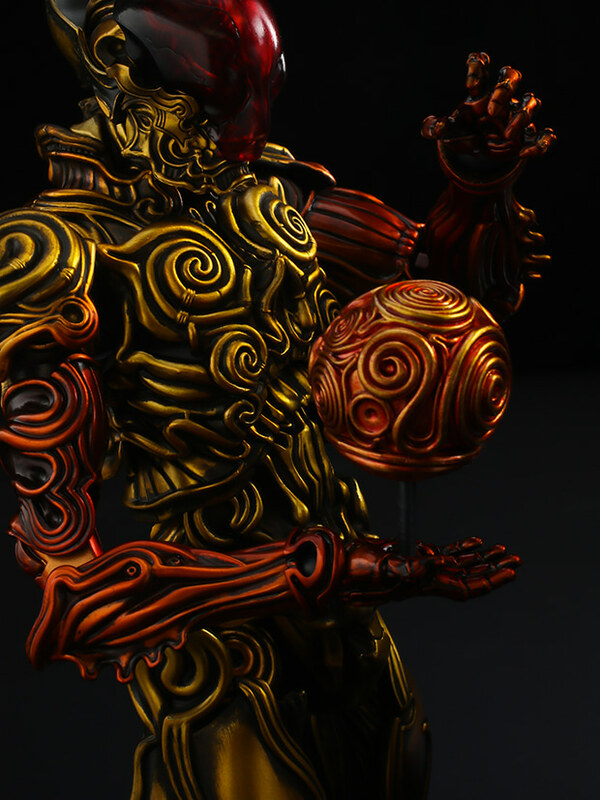 Pre-orders for will start on Tuesday February 20th 11AM JST at the 1000toys shop! 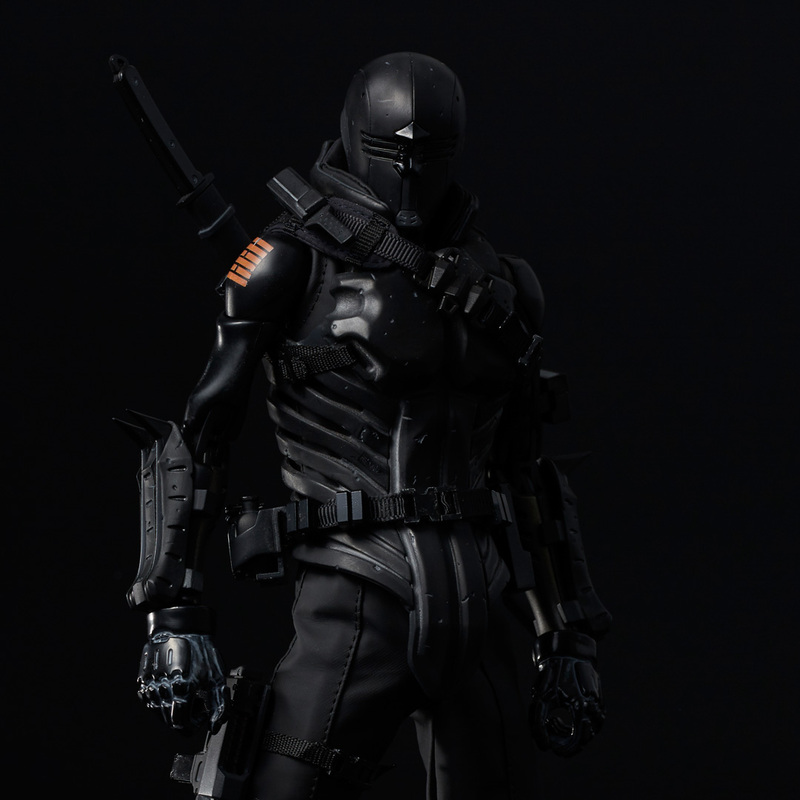 The original 1/6 scale Synthetic Human was the first release by 1000toys and kicked off the "TOA Heavy Industries" series of figures featuring original characters designed by manga creator Tsutomu Nihei and produced by 1000toys. 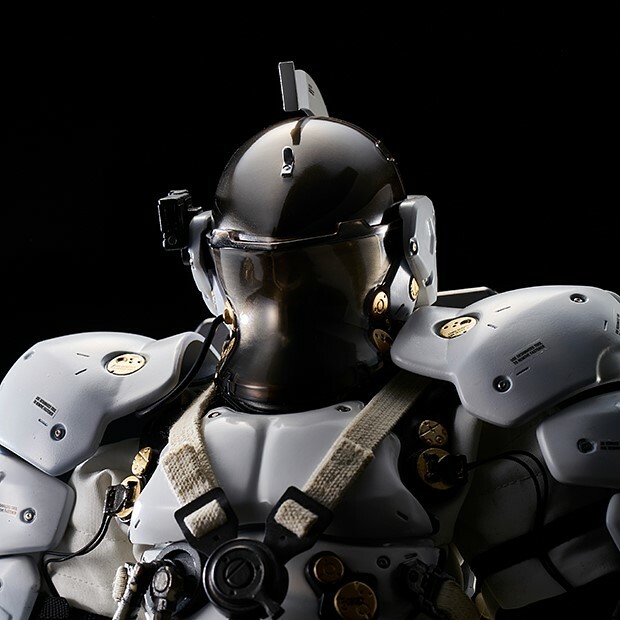 The 1/12 Synthetic Human is not just a downsized version of its 1/6 scale counterpart. 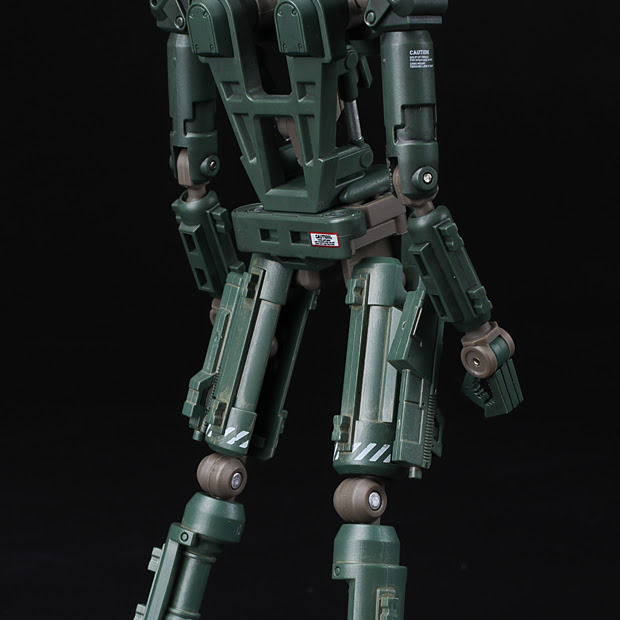 The figure’s articulation, gimmicks and silhouette have been refined and optimized for the 1/12 scale size. 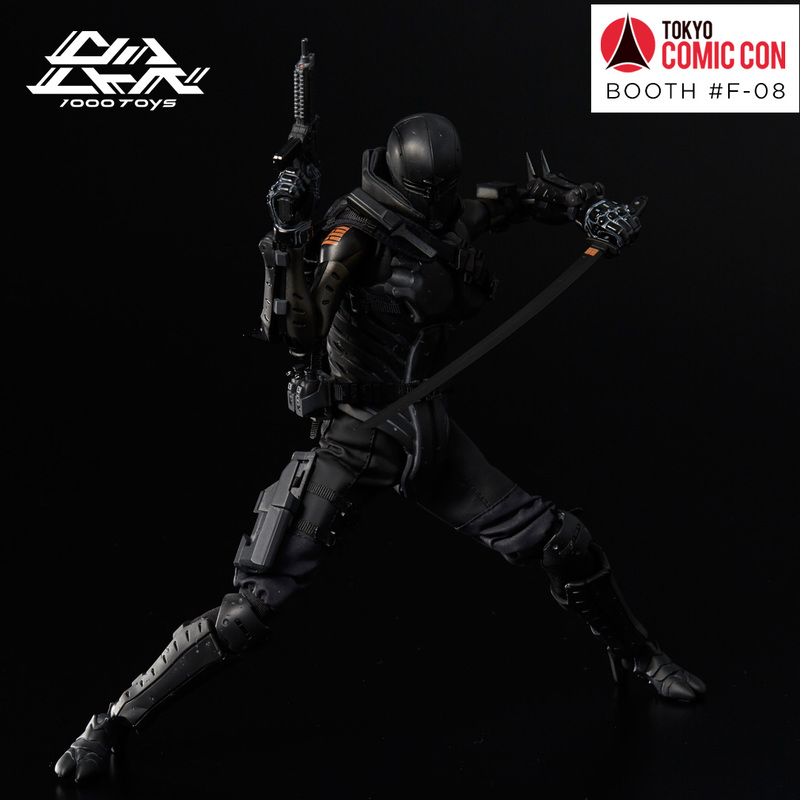 Note this item will also be solicited through Diamond Comics Distribution and D4 toys among other distributors. If you have concerns about import taxes and international shipping issues, we recommend you purchase this item through online shops or retailers in your area. 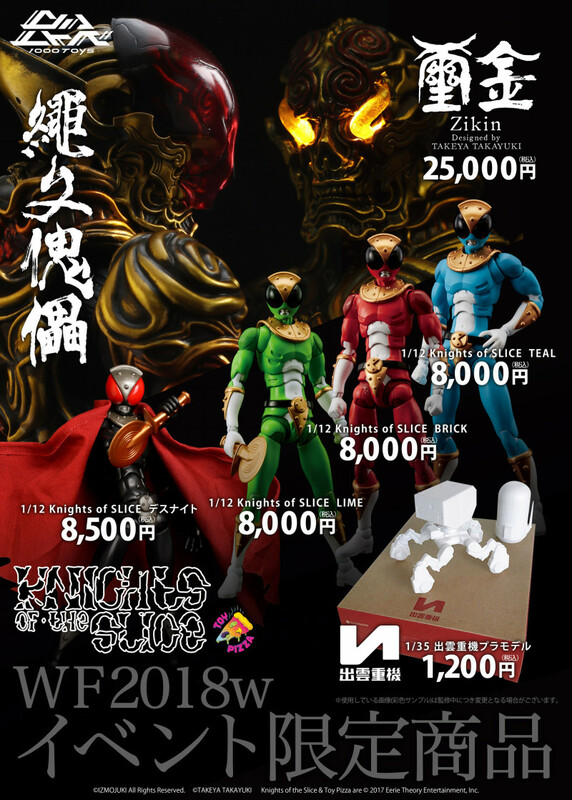 For anyone in areas without a local Japanese toy shop remember that the 1000toys online shop ships worldwide. ※Please note all import taxes will be the responsibility of the customer. 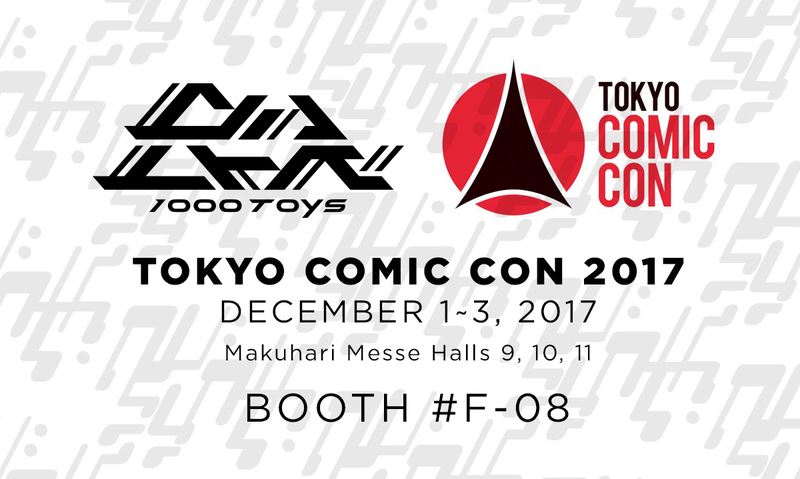 1000toys will be at Wonder Festival 2018 Winter Booth 3-13-2 which is happening on February 18th (Sunday) at Makuhari Messe in Japan. 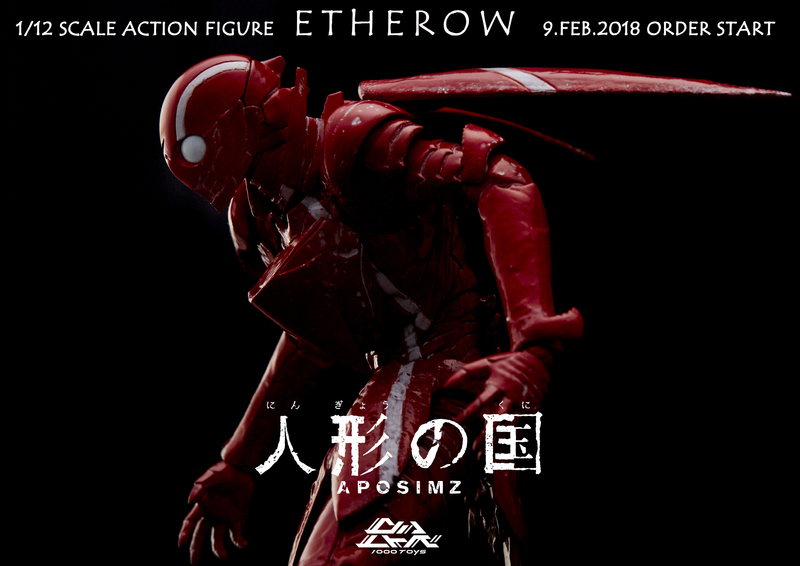 We will be showcasing the prototype of the new Aposimz 1/12 scale Etherow action figure which is currently available for pre-order. 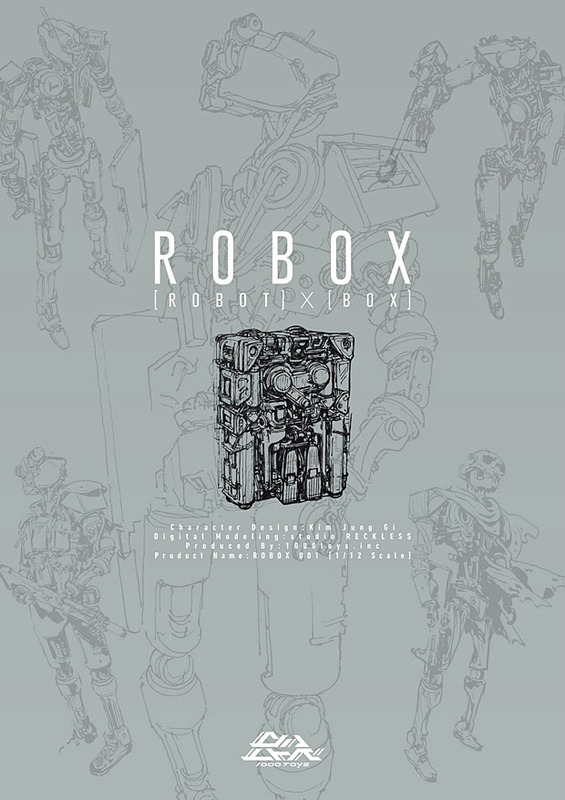 Also the newest colorways of the upcoming ROBOX project - our collaboration with illustrator Kim Jung Gi - will be on display. 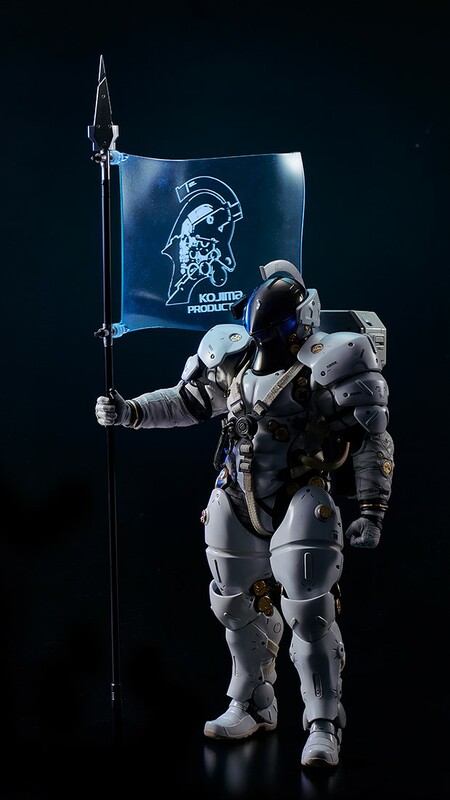 From the nu:synth initiative 1/12 scale artist collaboration line, we will have all four colors of the Knights of the Synth available for purchase! This includes the newest additions Lime and Teal plus the event exclusive Death Knight. This is your chance to collect them all! 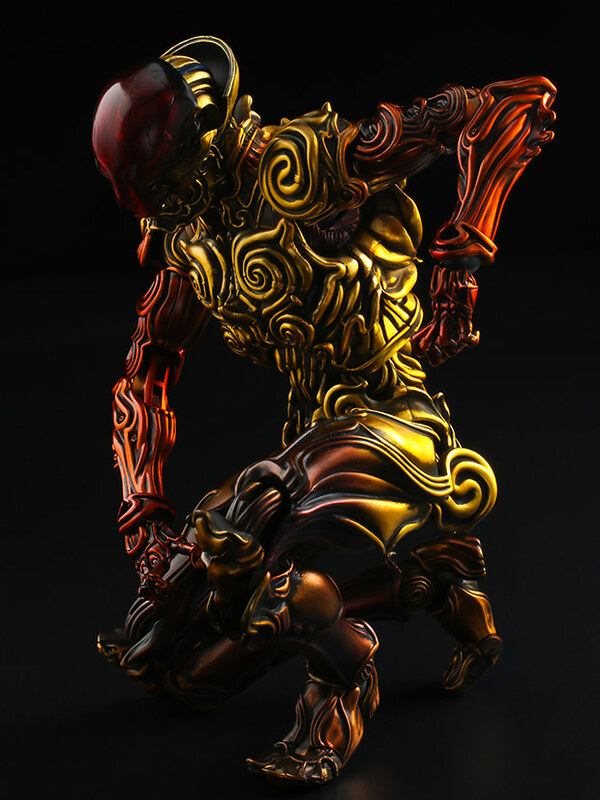 Also for Wonder Festival, we will be selling 1/6 Joumon Kugutu Zikin. 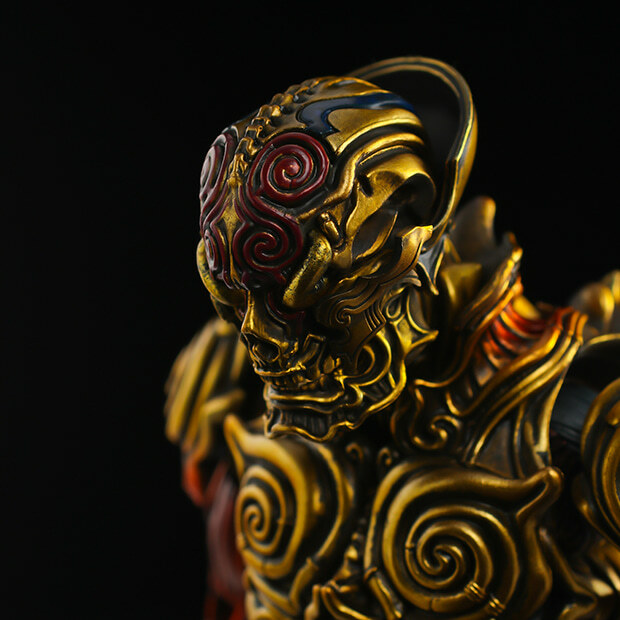 This is the elusive metallic gold version which is being made available for the first time in Japan. 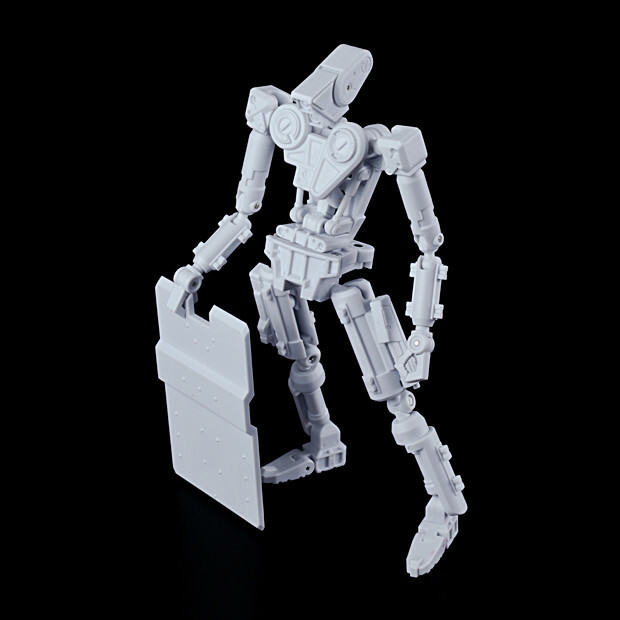 And last but not least, the 1/35 scale IZMOJUKI Probe 20WT Model Kit (White version) will be available for purchase. Please stop by Booth 3-13 if you are at the show! 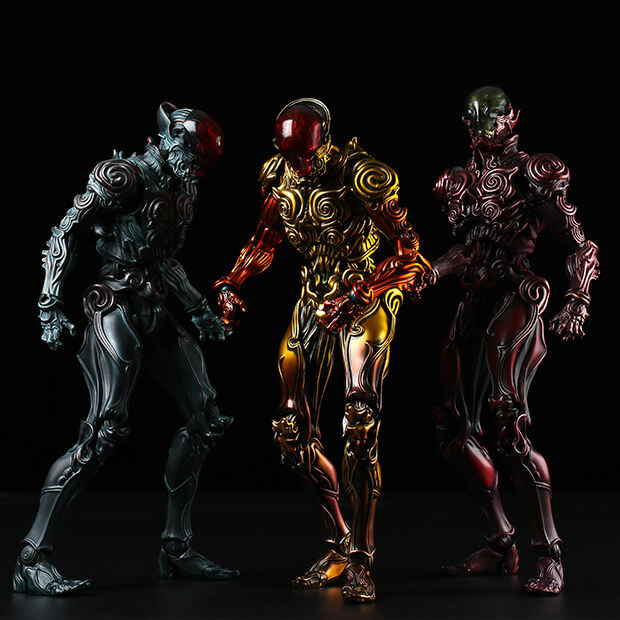 For more details on Wonder Festival 2018 Winter please visit the official Wonder Festival website below. 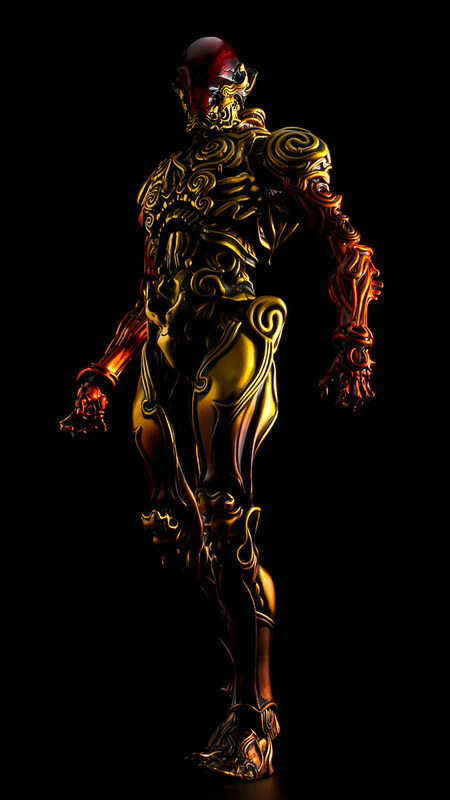 As previously announced, the pre-order for the 1/6 TOA Heavy Industries Synthetic Human Clear will close on February 15th 11AM (JST). For those who have already ordered we ask you double check your shipping address before the deadline to make sure all the details are correct. The shipping date for the product will be early March 2018. A deadline for any changes regarding your shipping address will be issued through our blog and social media accounts. 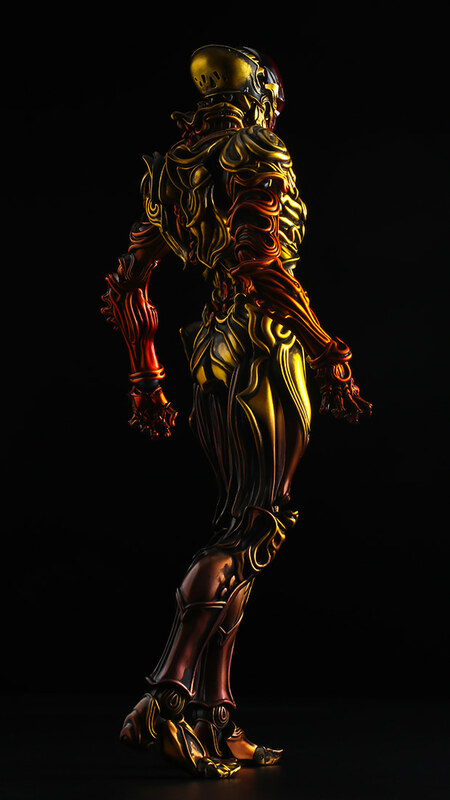 Product Name: 1/6 Synthetic Human Clear Ver. 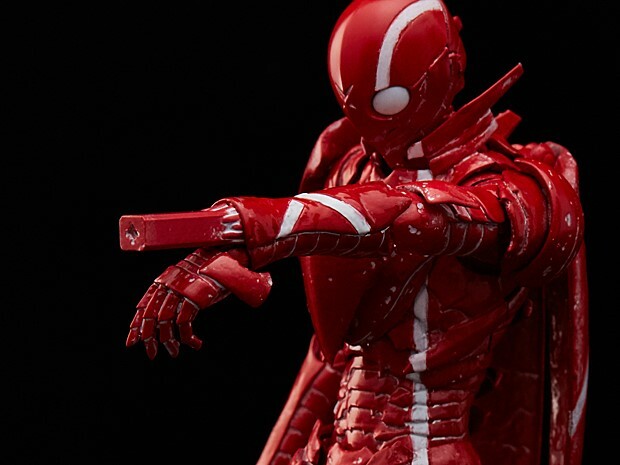 1000toys presents 1/12 Etherow Action Figure from Tsutomu Nihei newest work Aposimz! 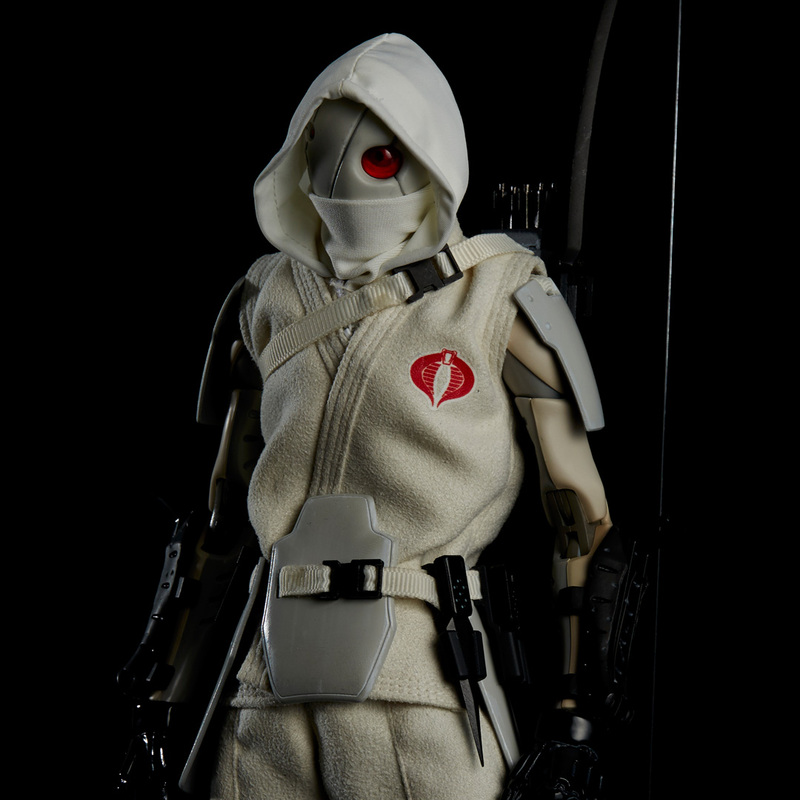 1000toys is happy to announce the 1/12 Etherow Action Figure from Tsutomu Nihei’s latest work “Aposimz”. 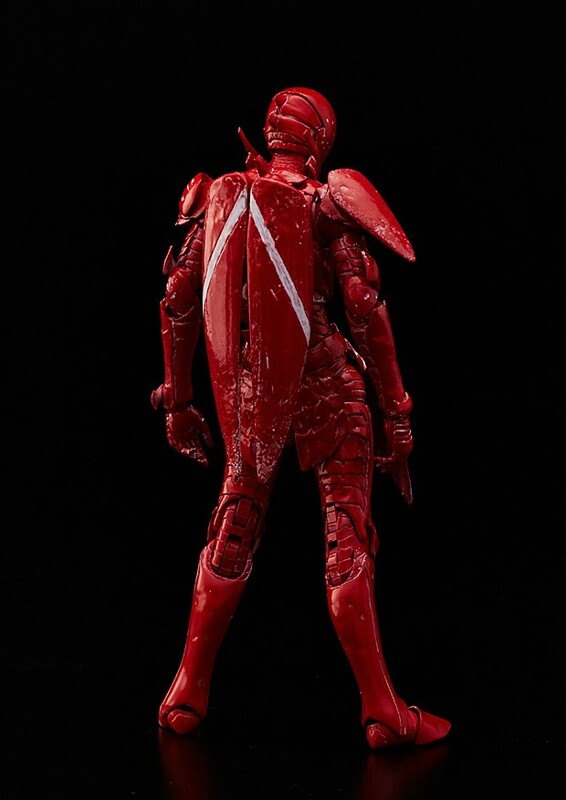 For fans of Nihei’s works, the second volume of Aposimz will be released in Japan tomorrow February 9th! 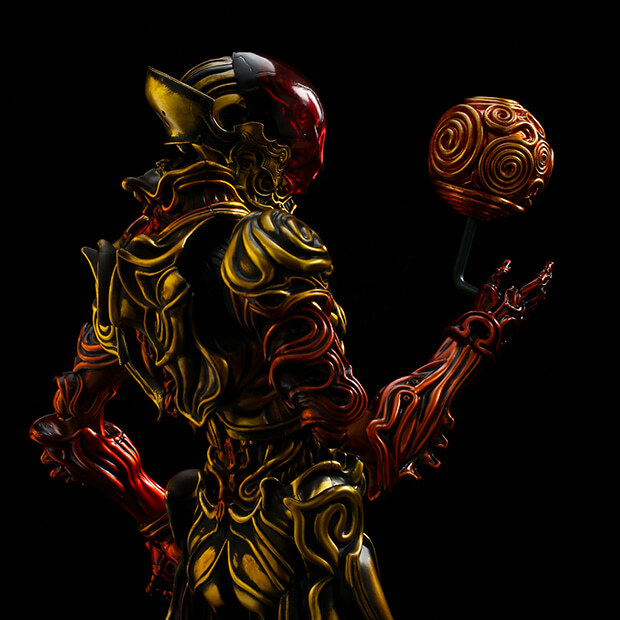 Born from the use of a special code, Etherow becomes the armored form as seen in the manga. 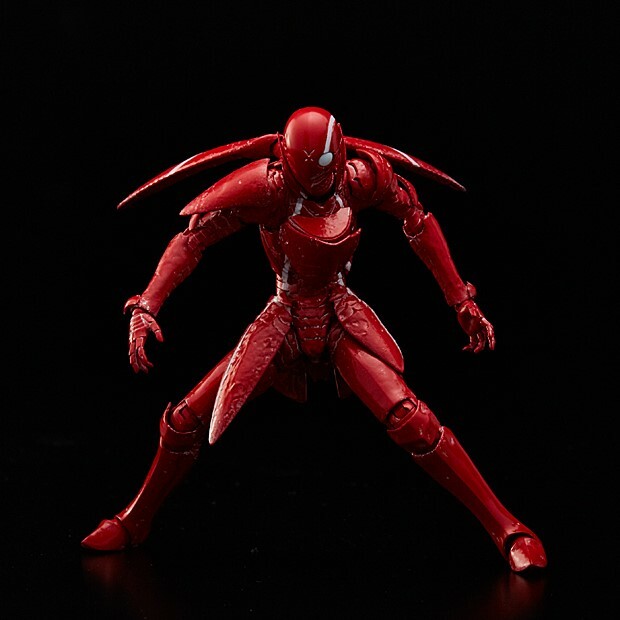 Based on the color illustration in the manga, the characteristic red design is not symmetrical and differs from side to side. 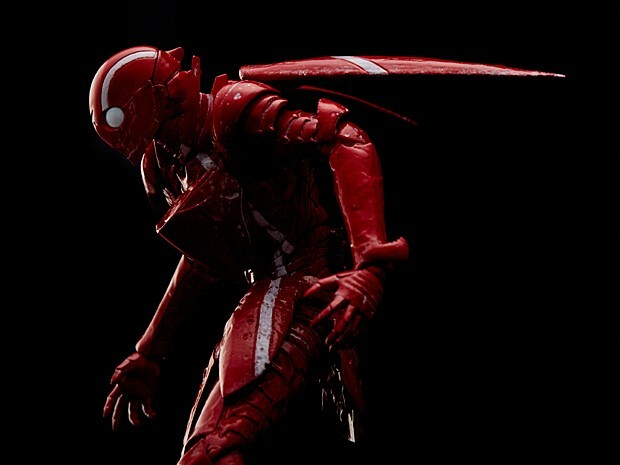 Details not seen in the manga have been added to the figure by the creator Tsutomu Nihei himself. 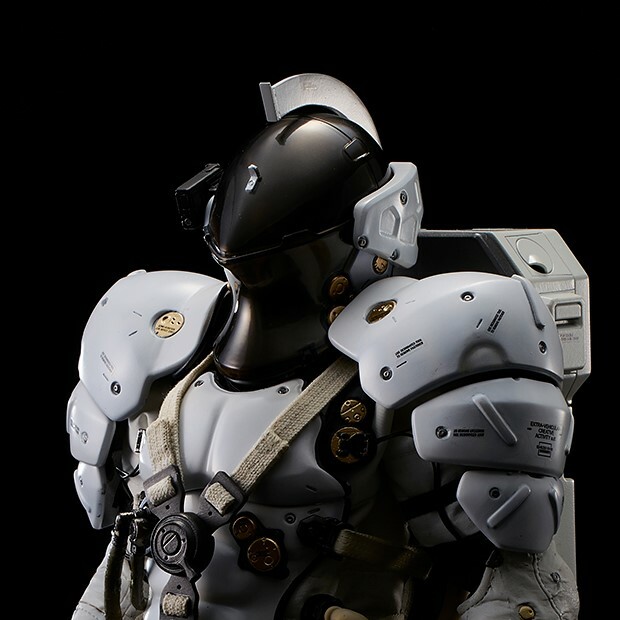 The joint system has been designed building on the experience we gained developing the 1/12 Synthetic Human and 1/12 BLAME! 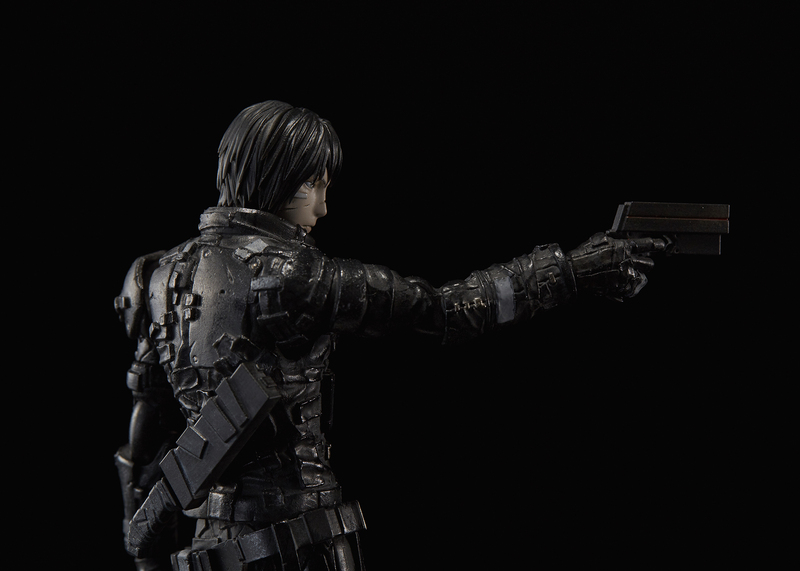 Killy figures and allow for maximum articulation without sacrificing any detail. 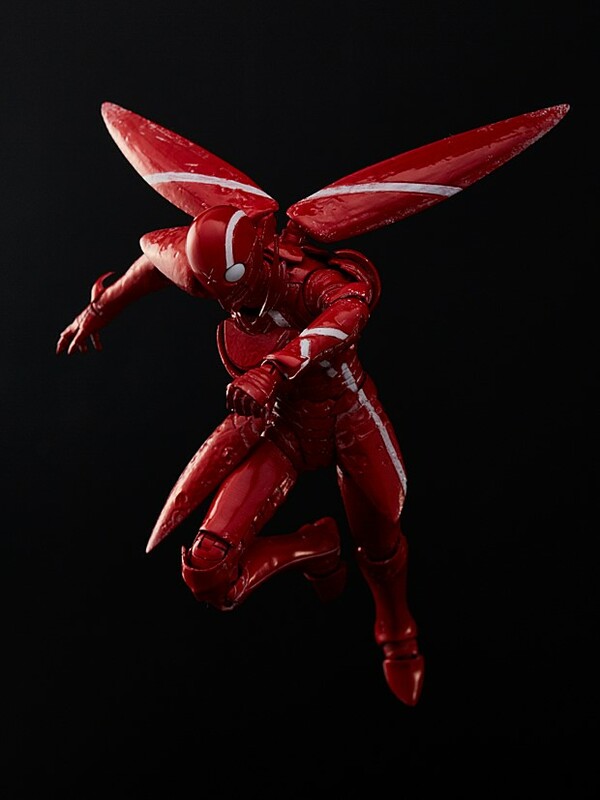 The two wings on the back are also articulated to allowing for incredible posing possibilities. 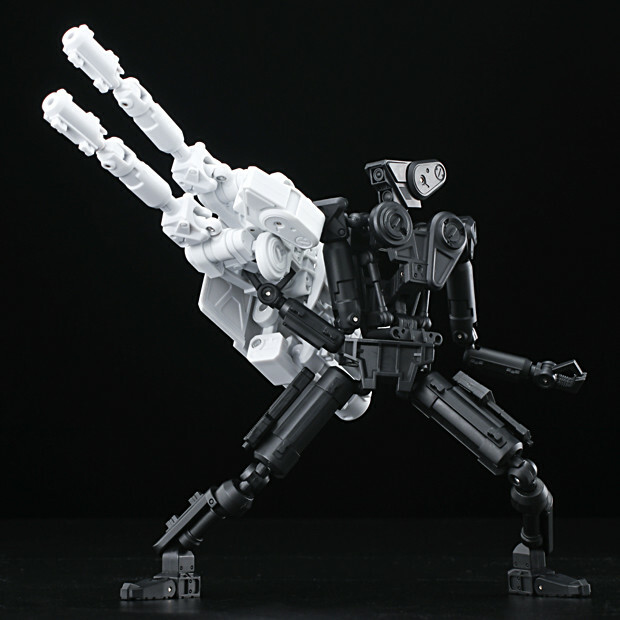 Also included is Etherow’s main weapon, the Ballistic Acceleration Device, which can be attached to either arm by exchanging parts. 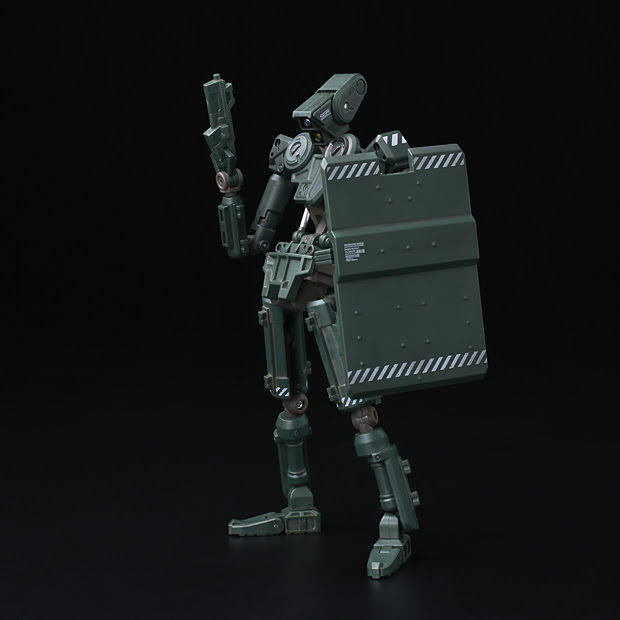 1000toys online shop special bonus! 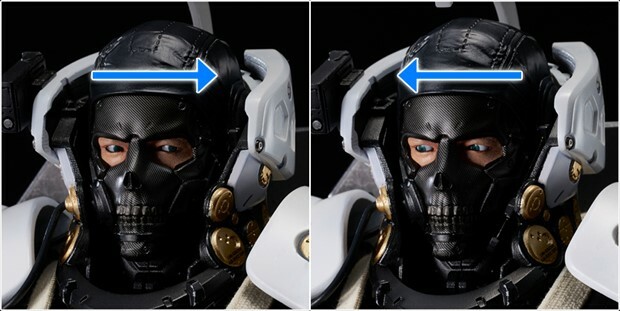 For those customers who order Etherow through the 1000toys shop, a special head part will be included. 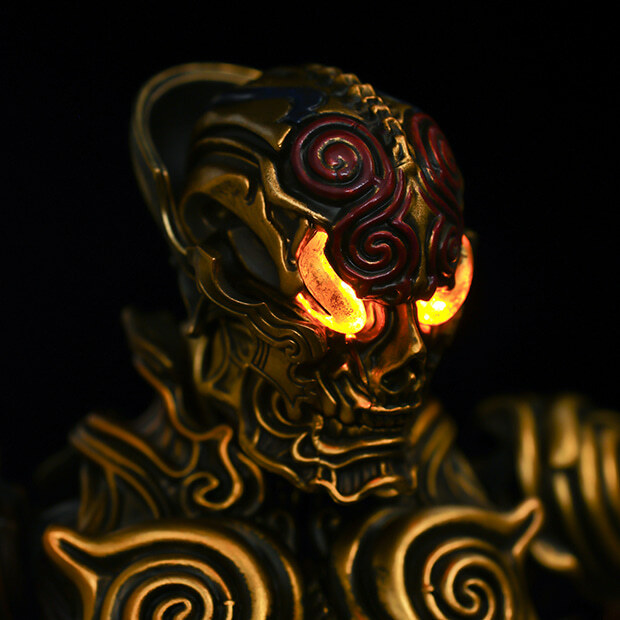 This special head part cannot be purchased anywhere else and depicts the Etherow as seen before completing the full transition into armored form. 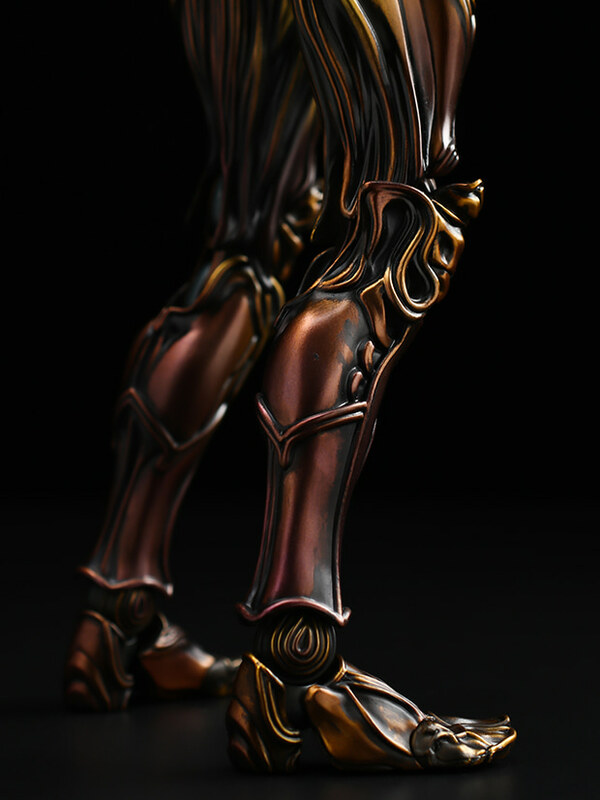 The hair, eye and even the teeth have been realistically rendered for this part. Orders will be closed on March 19th. 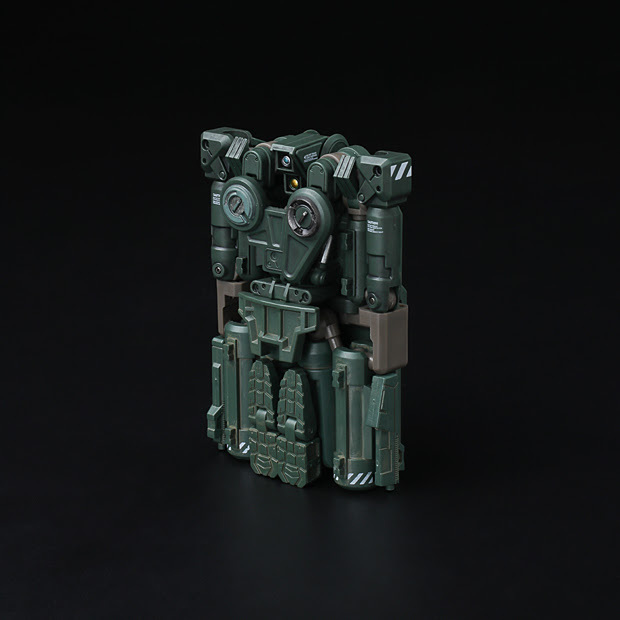 ※Product pictures are from samples and may have small differences with final product. 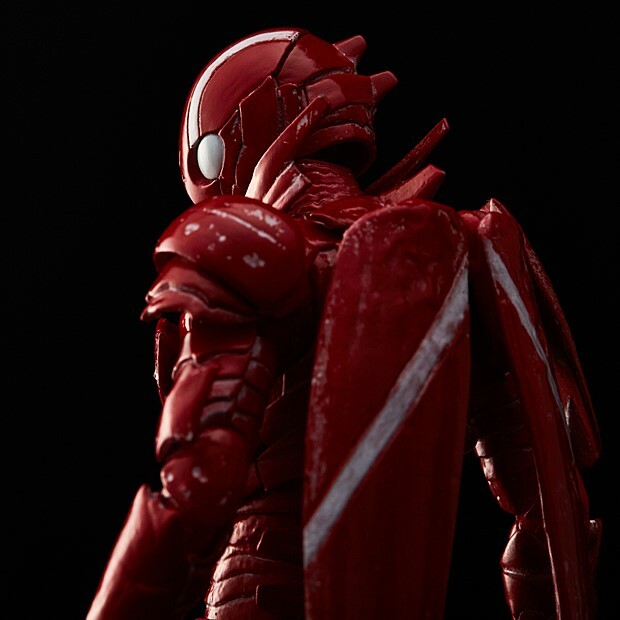 Pre-orders will start on February 9th at the 1000toys Web Shop as well as many other online retailers that sell Japanese toys. 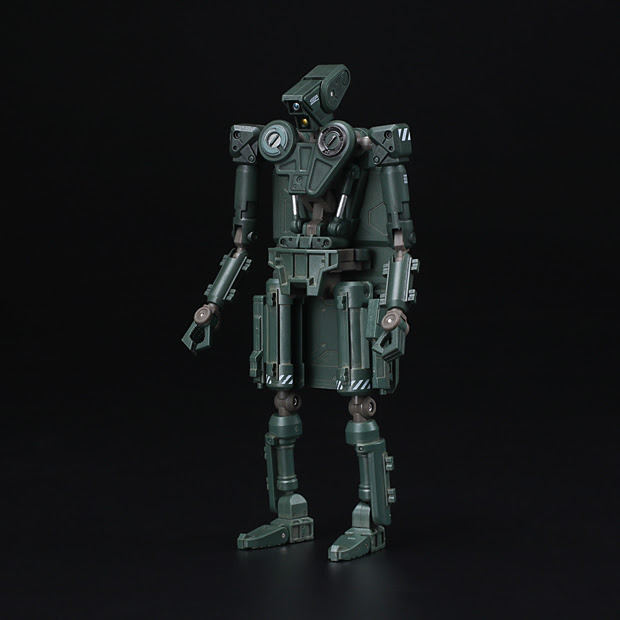 As an added bonus for those customer who purchase through the 1000toys Web Shop a special bonus part not available anywhere else will be included in the product. More details will be announced on February 8th so don't miss it! 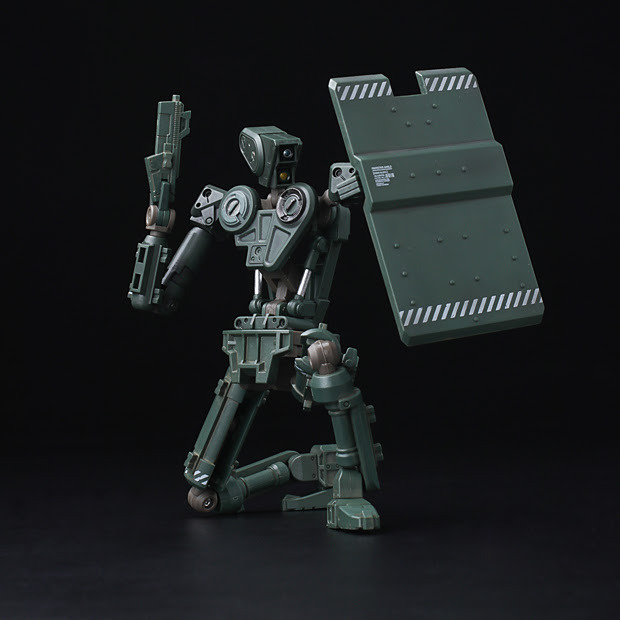 As you may know 1000toys recently opened Toys to Art - an online shop selling not just our products but a choice selection of figures and toys by independent creators from all over the world. 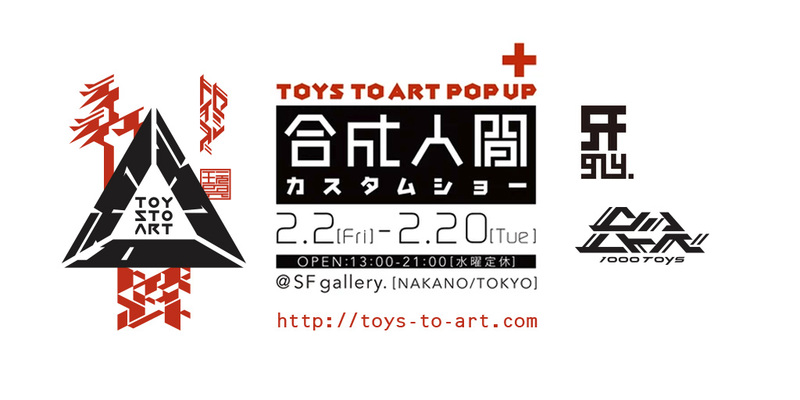 A special selection curated from the Toys to Art online store will be available at our Pop Up Shop in SF Gallery in Nakano, Tokyo. 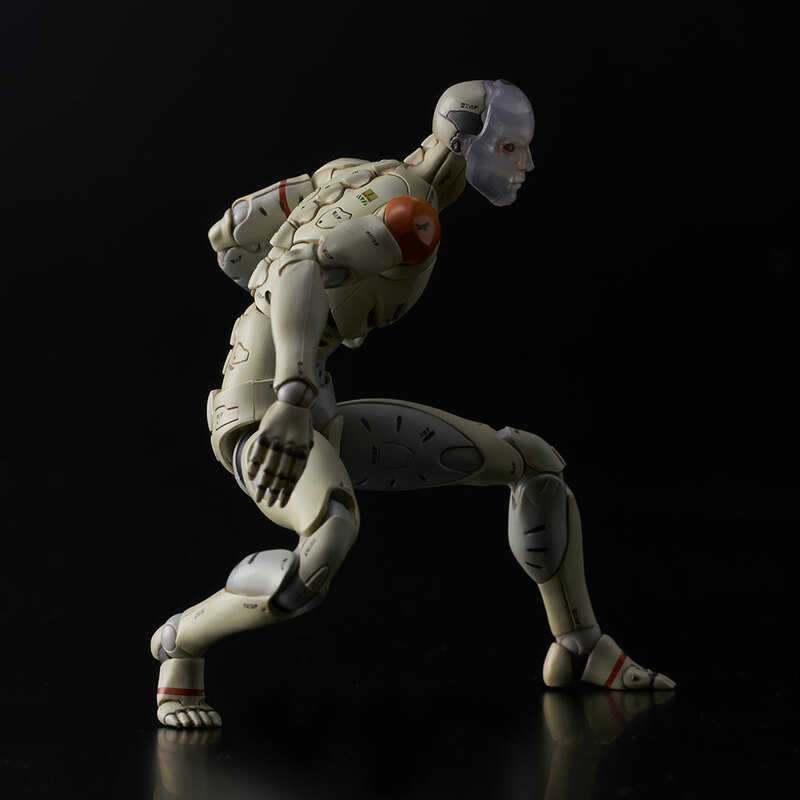 Plus we will be exhibiting the Synthetic Human Custom Show - our traveling exhibition of spectacular creations by international artists using our signature Synthetic Human figure as the platform. If you are in Tokyo please stop by! 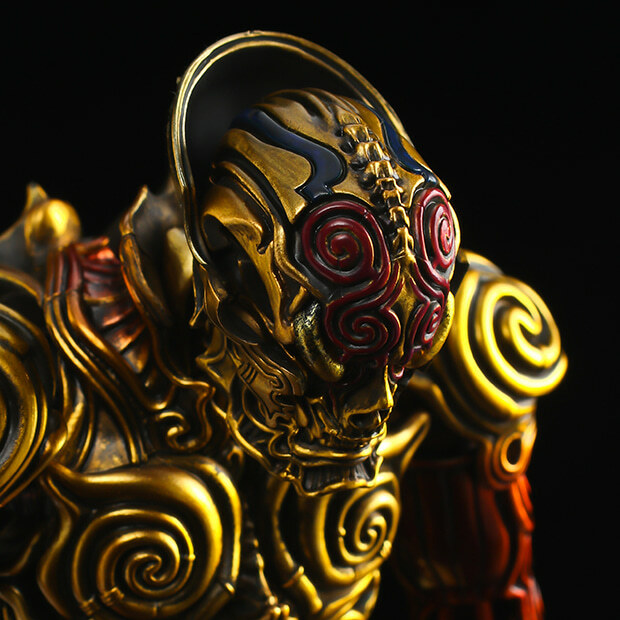 The Jyomon Kugutu Zikin previously sold at Thailand Toy Expo in May, 2017 will be available for JPY25,000 at Wonder Festival 2018 (Winter) that will be held February 18 at Makuhari Messa.This red gold "Zikin" version is the third release from the Jyomon Kugutu series following "Bokkoku" and "Enzi" and will be sold for the first time in Japan. Please note supplies for this version is very limited and may sell out quickly. 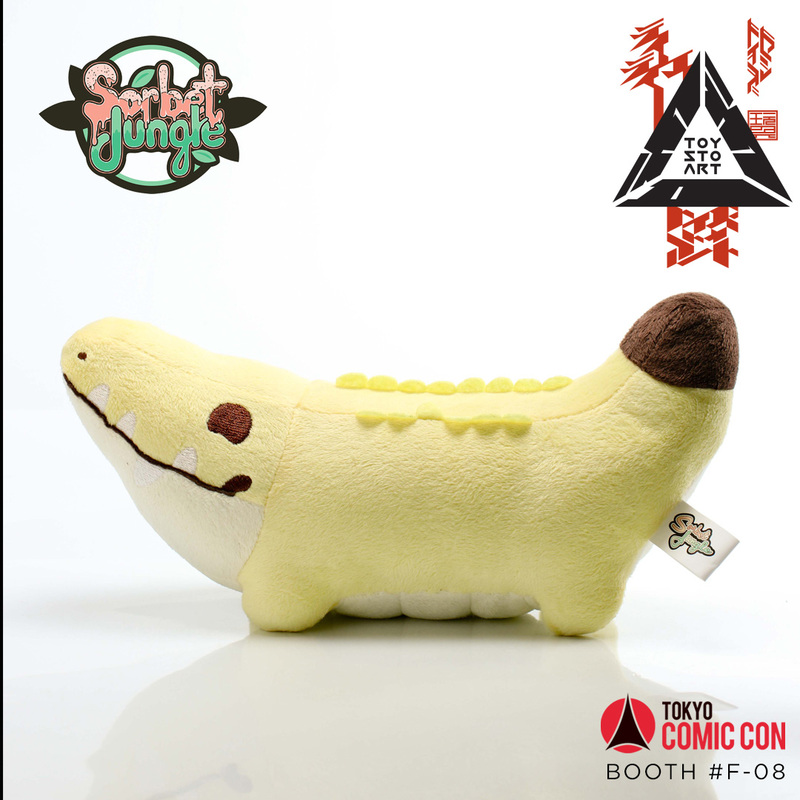 ※More details such as booth numbers will be announced later. A review of the product will follow in Japanese. The following two BLAME products have shipped by EMS and should start arriving soon. 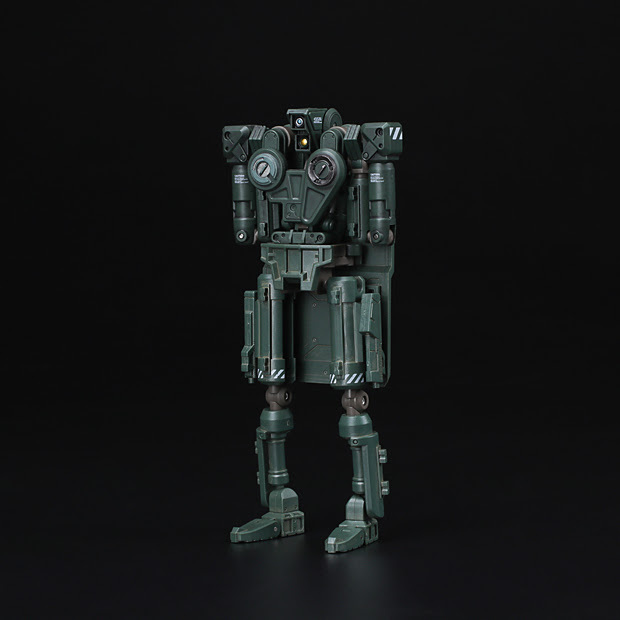 For details please check your Shipment Announcement e-mail that will be sent later today, or click the order from the purchase history for tracking numbers of your shipment once it is updated later today. Please note that as the shipment has been sent, it is impossible for us to change any details regarding your shipment. Please contact the post office in your region if there are any changes in the address for your shipment. 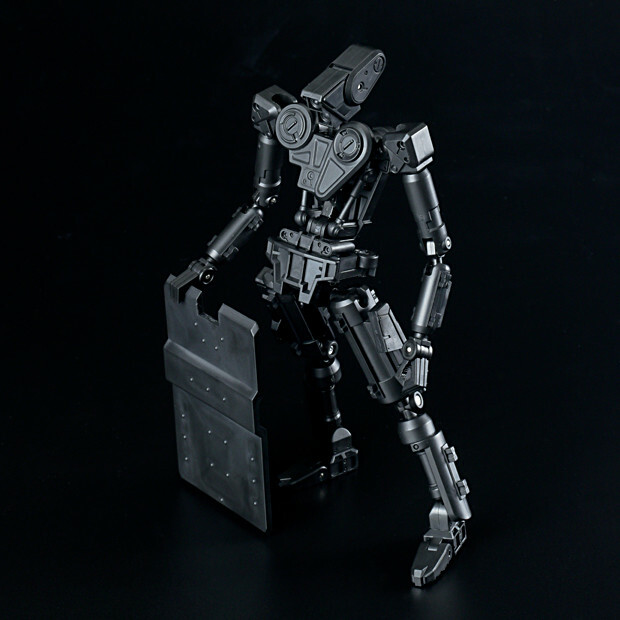 For those who have not received their Shipping Announcement by e-mail, please check your spam folder or your 1000toys account before contacting us. Our business will resume as usual on January 9th (Tuesday). 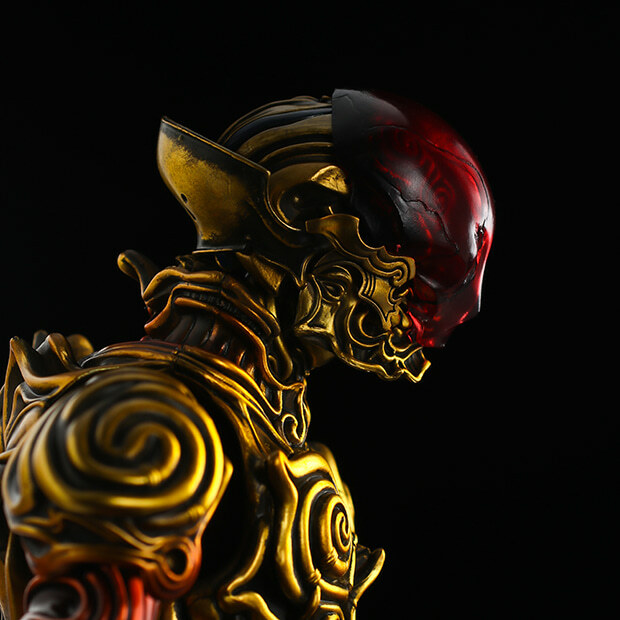 Any inquiries received by the 1000toys customer support during the period above will be corresponded in order of receipt from January 9th (Tuesday). Due to the volume of inquiries, please allow for 2 to 3 days from January 9th (Tuesday) for correspondence to inquiries sent during this period. 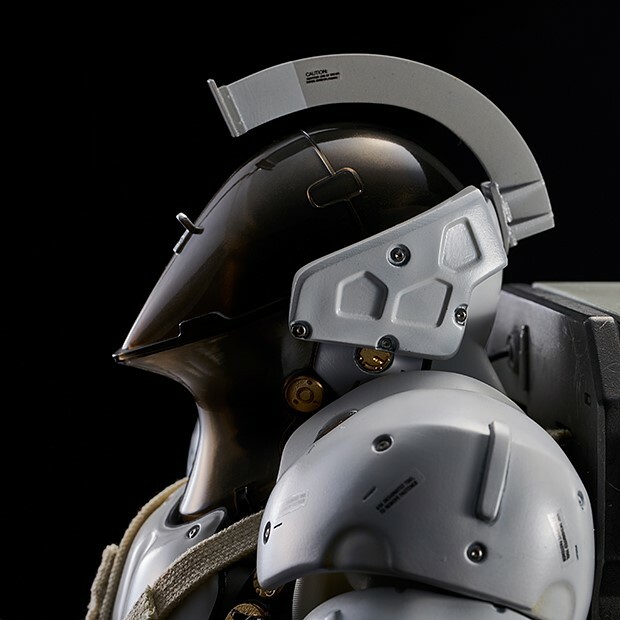 Kojima Productions 1/6 Ludens now available for pre-order! Yes! The wait is over!! 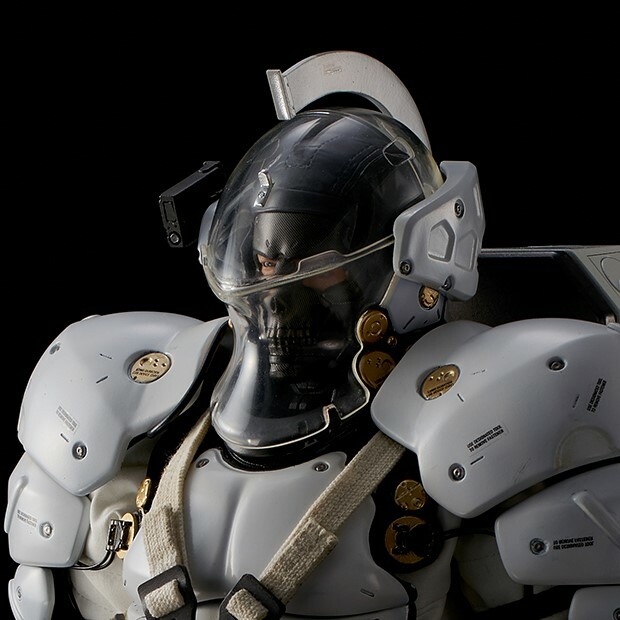 The 1000toys produced 1/6 scale action figure of Ludens - “the icon character” for Kojima Productions - is now available for pre-order! 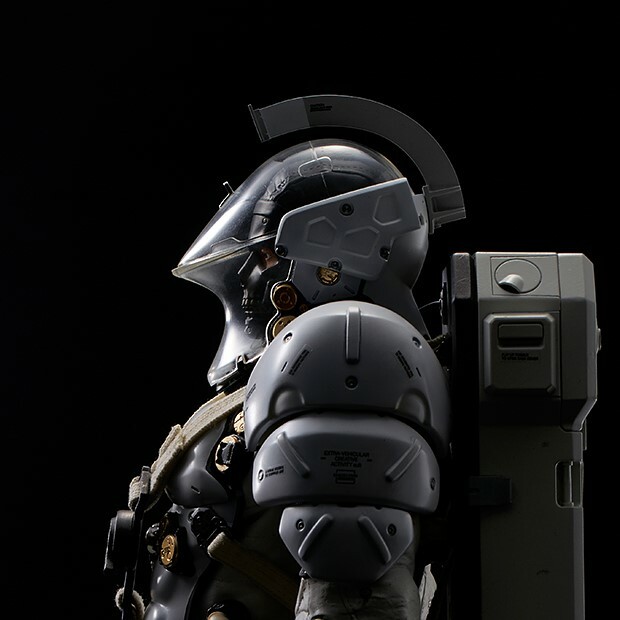 The figure wears an EVA (extra-vehicular activity) Creative Suit that consists of mixed materials including ABS, PVC and real cloth. Painstaking attention to detail has been paid to the markings on the suit to improve the overall realism of the final product. 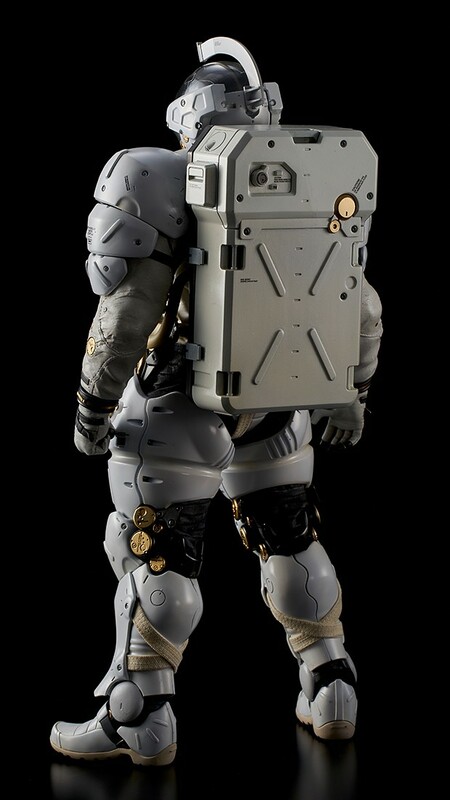 One design point of pride is that the EVA Creative Suit will be completely seamless with no visible joints - giving the final piece a massive and heavy presence. 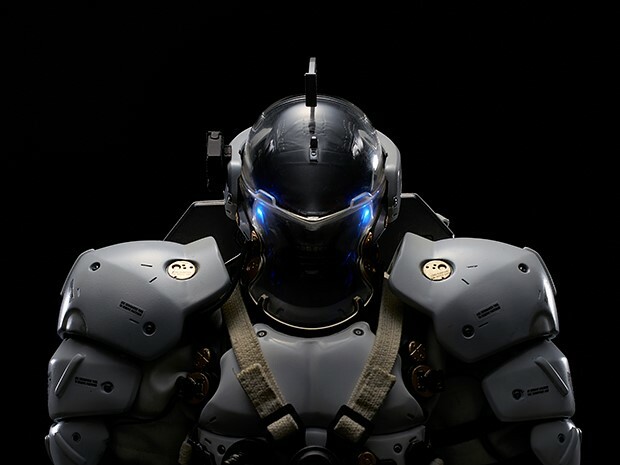 Inside the helmet is a perfect recreation of the face as seen in the teaser movie and production art released by Kojima Productions. 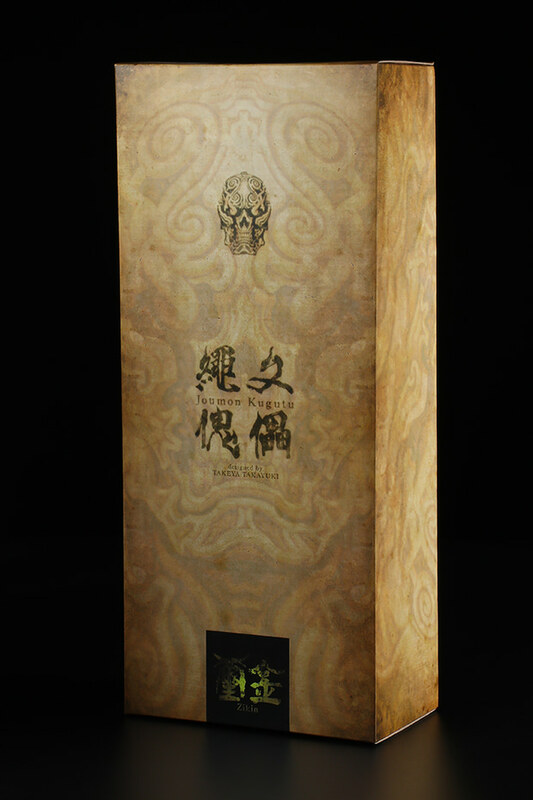 The skull shaped face mask has also been faithfully reproduced following the original design. 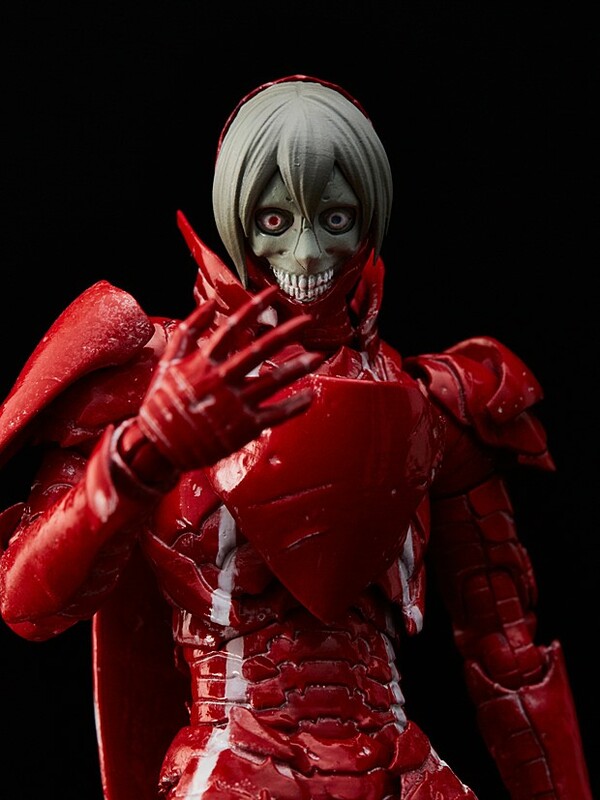 This large 1/6 scale toy features movable eyes adding further realism to any pose. 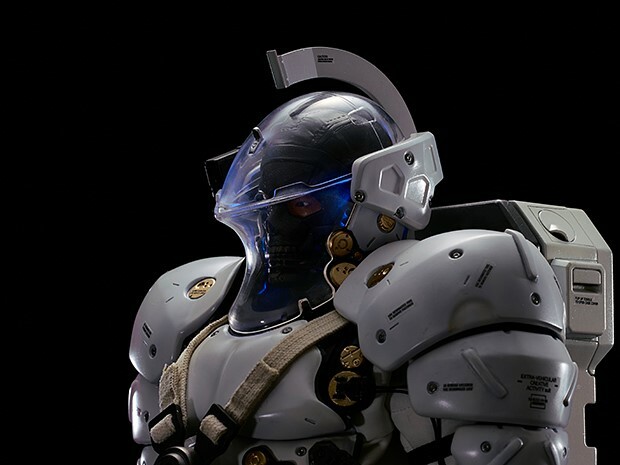 LED lights built into the helmet lets you to recreate the iconic look of Ludens in his debut scene from the short promotional movie produced by Kojima Productions. 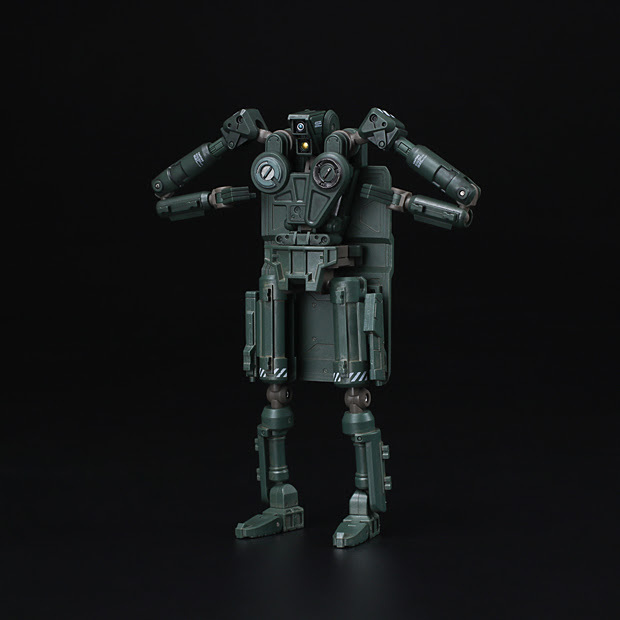 The figure features an incredible 46 points of articulation with built-in points of articulation on the inner frame including several clicking joints. 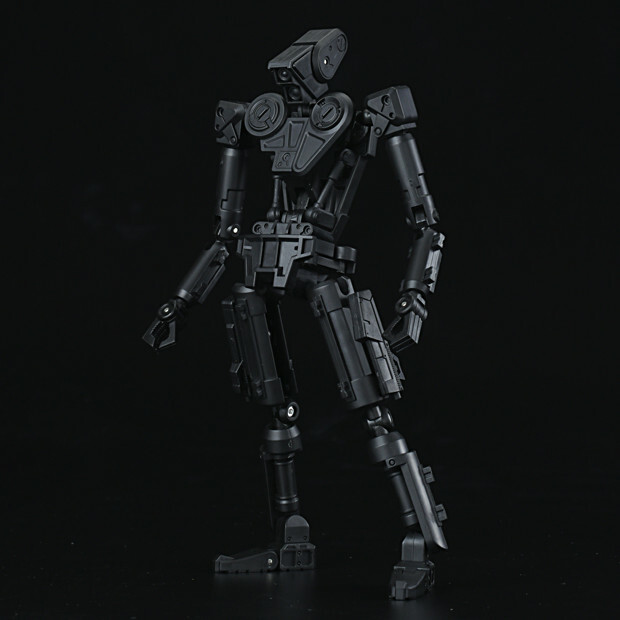 The newly developed inner frame allows this figure to have a massive silhouette without sacrificing any articulation. 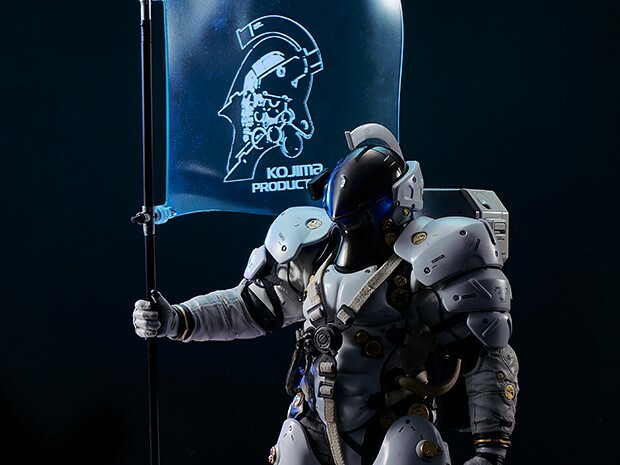 The included beam flag is made from clear material with a crisp pad printed logo faithfully replicating the version seen in the promotional movie. 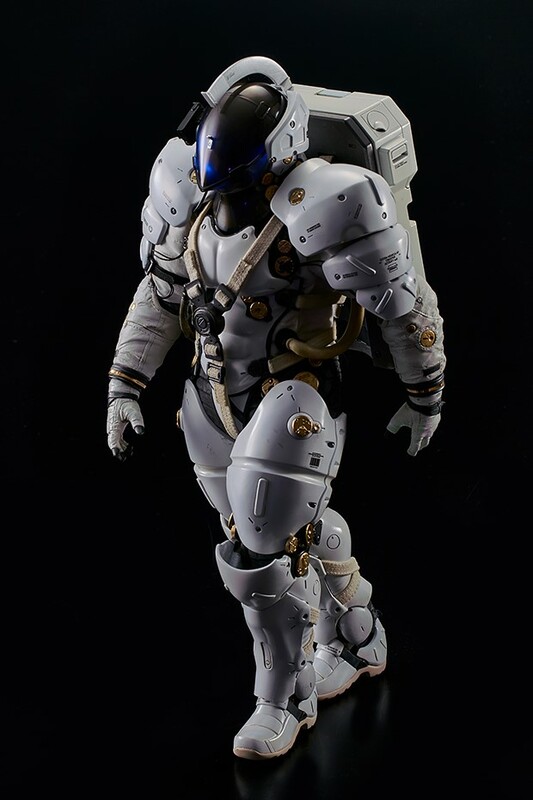 1/6 Ludens Action Figure is now on pre-order so order now!